Well, I am proud to say that it finally happened! 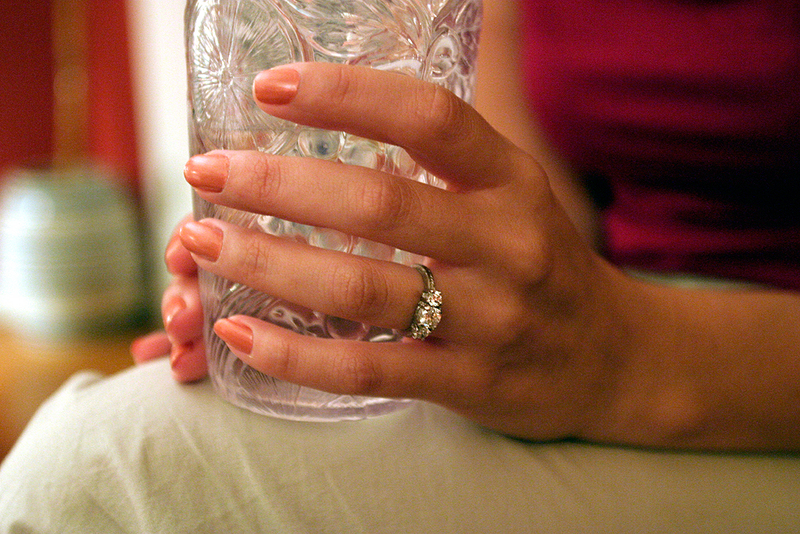 This past Tuesday evening, I proposed to Lacey, my girlfriend of over 6 years. I am so thankful to have been blessed with the opportunity to be with Lacey for the past 6 years, and I am really looking forward to spending the rest of my life with her as my wife. Thanks to everyone who has sent on words of congratulation and encouragement! Back when the original Apple iPod came out, I was an early adopter, and elected to purchase a 10 GB iPod. Soon after, it became a part of my everyday routine. I was enamored by its sleek design, ease of use, and the sheer mass of music that I could carry around in my pocket. It synched beautifully with my PowerBook, and allowed me to enjoy music in my car. I loved my iPod. A few weeks ago, Apple released a brand new music store that integrates directly with iTunes 4.0. Wow! Yet another wonderful use for my iPod. I tried out the music store, and I was impressed by how convenient it was. Of course, I read a lot of bickering about DRM restrictions, audio quality, and lack of selection, but this really didn’t phase me. All I know is that I can legally download songs from a fairly wide range of artists, carry them around with me wherever I go. Simply fantastic. Along with the new music store, Apple updated its iPod line. The newest iPod is thinner, can hold more music, comes with a cool dock, and is entirely controlled via touch-sensitive buttons and scrollers. Last night I sold my original iPod for a decent amount and promptly went out and purchased a brand new 30 GB iPod. My experience thus-far has been excellent. Overall, I am pleased with my purchase. I think the new iPod is definitely an improvement over the original, and is sure to provide me with countless hours of musical love. Well, its been a long time since I have updated this site, and I apologize for that. I have been back in the country over a month now, and a lot has happened. Most of it can be summarized by the following picture. It finally happened. After five hard years of work at Georgia Tech, I have finally graduated. I received a Bachelors of Science in Computer Science, graduating with Highest Honor under the Cooperative Plan. I have had a great time at Georgia Tech, in spite of the school itself. Reflecting on my time at Georgia Tech, I can truly say that I do not regret a single moment of my time there, and while it was difficult, even smothering at times, it was a rewarding experience that I wouldn't trade for anything. I have heard Georgia Tech referred to as an "intellectual boot camp" many times before, and I must say that the description fits. Georgia Tech can be a punishing place, and many times you can feel like it has beaten you. But, when you leave, you look up at the Tech Tower and truly believe that you can accomplish anything. What made it worthwhile, you say? Well, that question is easy to answer—my friends. 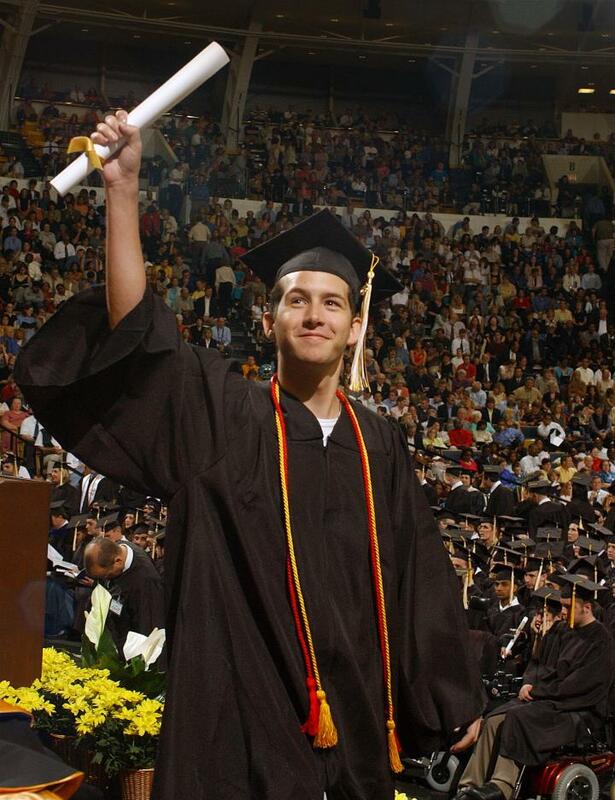 In my five years at Georgia Tech, I have had the pleasure of meeting some of the greatest friends a guy could ask for. These people have shaped my life, and through their greatness they have made me a better man. When I say these things, I am mostly speaking of my brothers in Delta Chi. Don't believe the stereotypes—true fraternity is a huge blessing. So, what now, you ask? I accepted a full-time position with my co-op company, VertiSoft, and started a few weeks ago. VertiSoft is a medical software company based out of Roswell, GA that delivers one of the most innovative and useful software suites in the business. 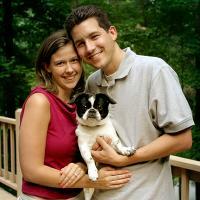 The company is currently evolving and is rapidly becoming an excellent company. I do not have any official titles, but I work in the software development side of the business, and am currently working on research and development for a new and exciting project. In summary, life is good. 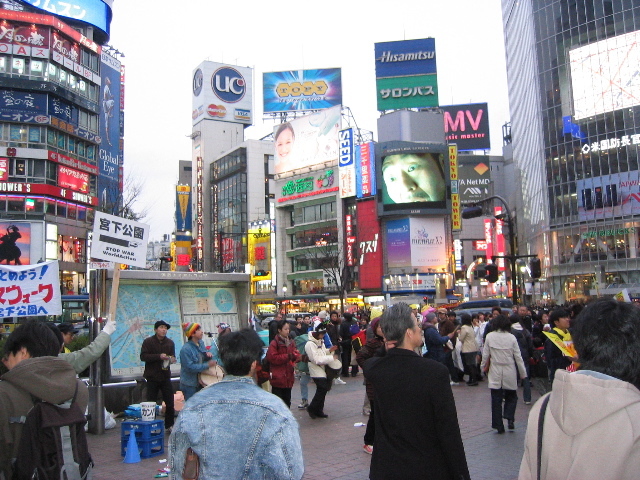 This weekend, I went with a large group of friends for a three day, two night trip to the great city of Tokyo. We left on Friday on the 11:30 AM Shinsaken bullet train, and stopped in Kyoto for lunch. 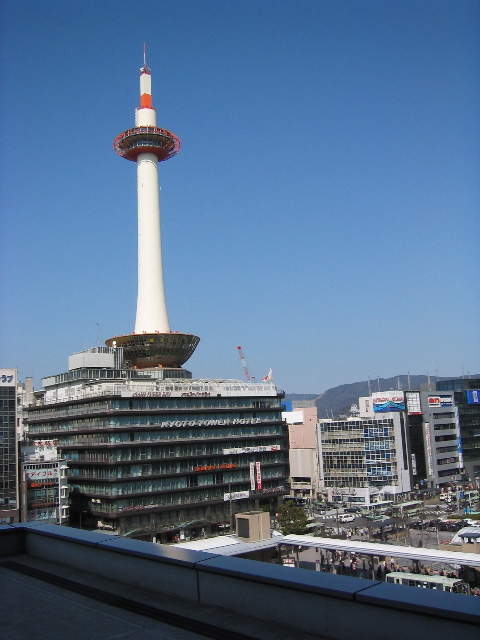 When I stayed in Kyoto earlier in the trip, I never was able to make it to the top of the station to have a look at the tower, so we used our 1 hour layover to take a short trip to the top of the station. 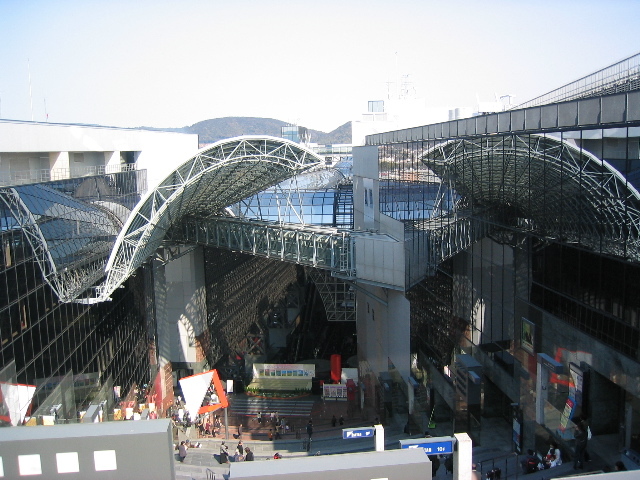 The station has a series of many open-air escalators under a beautiful glass overhang. We took some pictures and then boarded the train again, bound for Tokyo. We arrived in Tokyo around 5:30 PM, and took a short local train trip to our hotel, which was located across the street from Shinagawa Station, in the heart of Tokyo. 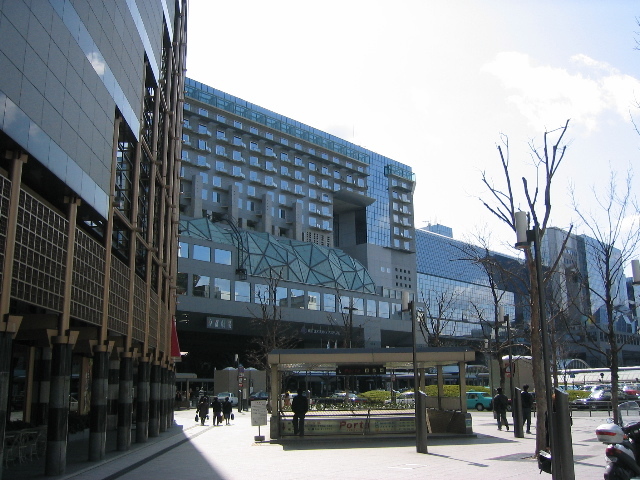 We stayed in the Shinagawa Prince Hotel, which is a pretty nice hotel, and we managed to cram a bunch of people into the rooms to make it affordable. That night, we walked around a bit, and eventually ate dinner at T.G.I. Friday’s (hooray for American food!) before calling it a night. The next morning, we started our day with a trip to Akihabara, home of Tokyo’s Electric Town, which is like the Mecca of discount electronics. There are bright lights, shouting merchants, and crazy gadgets as far as the eye can see. Following this, we took another train to Ginza to see the Sony Building. Unfortunately, the Sony Building was largely under renovation, so we did not get to see any more gadgets — I nearly cried. After recovering from the Sony disappointment, we ate lunch in Ginza. 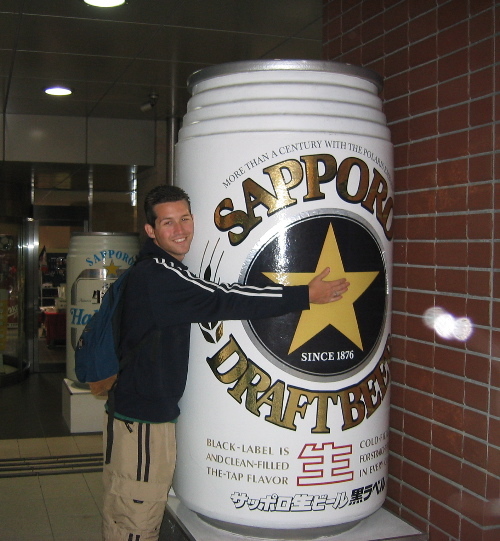 Feeling refreshed, we took yet another train to Ebisu, a really nice district of Tokyo, and home to Sapporo breweries. Here, we visited the Yebisu Beer Museum, and enjoyed sampling some of Sapporo’s fine selection of liquid bread, which I must say that I found very tasty. Next, we made even more use of our Japan Rail passes, and took the train to Shibuya, which probably fit the stereotypical image of Tokyo better than any other place that I visited. We bursted out of the station into a mass of people, video screens, tall buildings, and anti-war chanting. 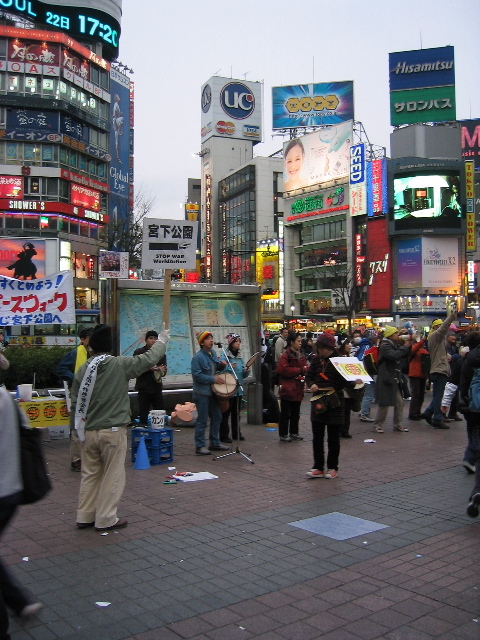 Shibuya is a trendy spot to hang out for young people, and they were out in full force protesting the war in Iraq. After Shibuya, we visited a nice shopping district not too far away, and then went to dinner at the Outback Steakhouse, which produced the first normal and acceptable hamburger that I have eaten since I left the States! After dinner, we headed out to Rotangi, a very sketchy bar and club district. This place was pretty nuts, and is built on some strange system of bartering and negotation over the price of drinks… we finally settled down somewhere, had a few drinks, and went back to the hotel feeling exhausted. This morning, we started our day by visiting the Imperial Palance, which was extremely anti-climactic. The gardens are unattractive, and the palace itself is so heavily guarded that you can’t see hardly any of it. 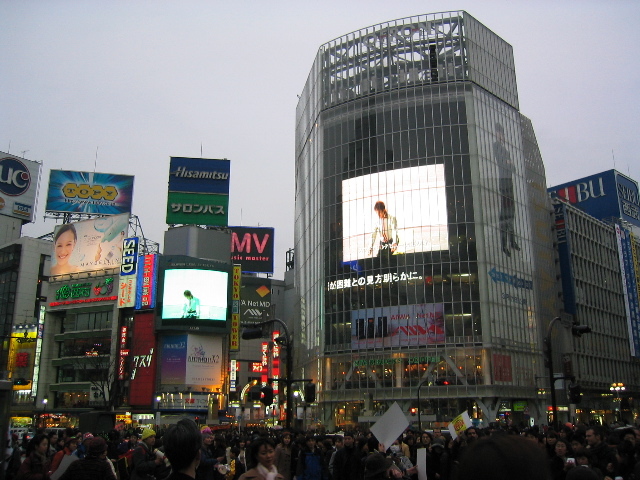 We then visited Shinjuku, which is supposed to be like the Times Square of Tokyo. 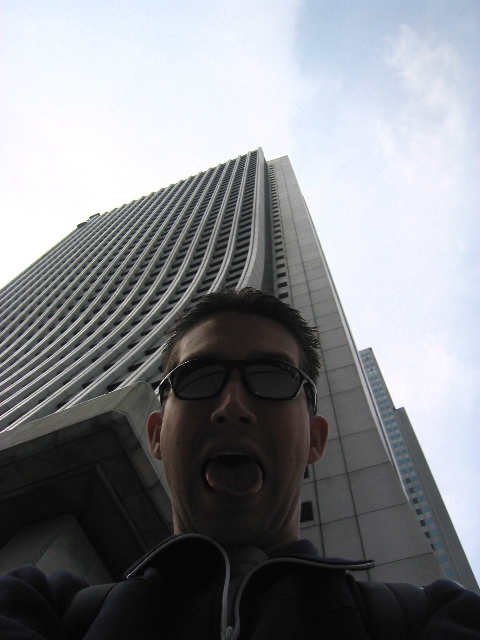 In Shinjuku, we climbed to the top of a massive twin tower building to see the entire city. The view was amazing, and it became quickly clear that Tokyo is a very polluted city — the haze rivals Atlanta! Then, we went back to Electric Town for one last look at all the crazy electronics. Well, our train is pulling into the station! 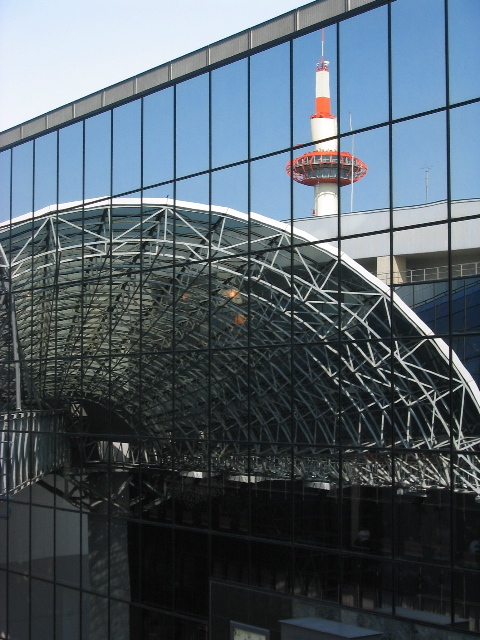 I will write about Kanazawa ASAP! Love you and miss you all! 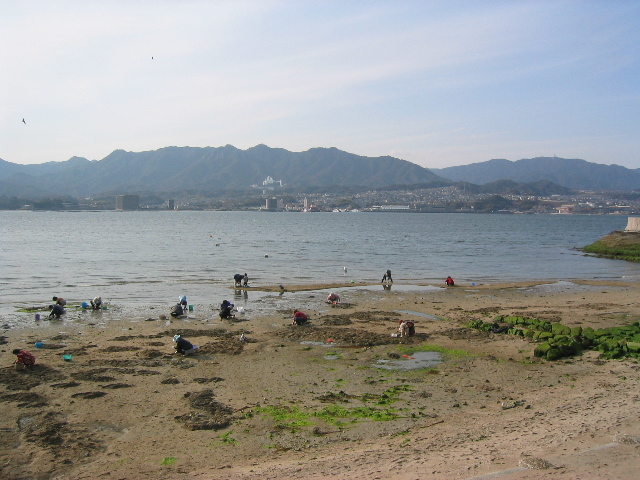 Yesterday, a group of us hopped on a train after class and then took a ferry out to a small island near Hiroshima called Miyajima. The ferry ride out to the island was beautiful, and we were able to see beautiful parks, a seven story pagoda, and watch the locals collecting clams off the beach at low tide. The island was stunningly beautiful, and there were deer running around everywhere that we were free to pet and feed. There were little shops selling every range of goods, from freshly brewed sake, to giant statues of Buddha, to cheesy tourist items. The island was an excellent day trip, and I thoroughly enjoyed my visit! Today, on the same day that the United States began its attack on Iraq, I visited the Hiroshima Peace Park and Museum, which commemorates the dropping of the first atomic bomb on Hiroshima during the second World War. The park is quite beautiful, and has several significant sites of interest. 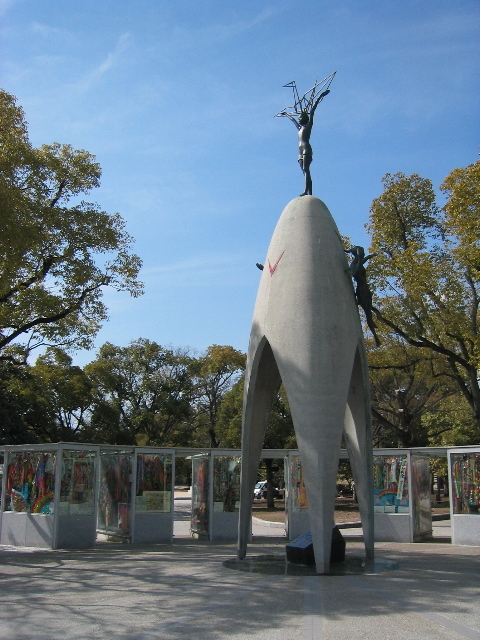 First, is the children's memorial, which stands as a monument to the children who died as a result of the bomb, including those who died from aftereffects of radiation. The memorial is filled with many origami cranes, because there was a child who believed that she would be able to survive the radiation if she folded 1000 cranes — she died before she made it to 1000, but new cranes arrive every day in her memory. The next significant monument in the park is the victims mound, which sits in the middle of the park. 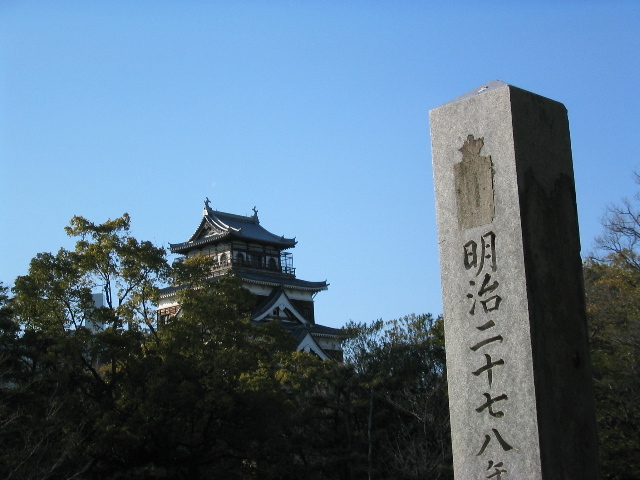 The mound is made out of the ashes of many of the victims of the bomb, and is a shocking memorial of the terror of that day. Following our walk through the park, we visited the museum, which is an excellent way to get a feel for the history of the area and of the dropping of the bomb. The museum and the city are harshly aligned against nuclear testing, and are constantly fighting for the destruction of all nuclear weaponry. My experience at the museum touched me, and struck a real chord in my heart and mind as our country heads to war. It made me think about the impacts of the war that we have entered into, and while I don't like the fact that we have elected for the use of force without the support of the world, I do hope that the elimination of one more tyrant will make the world a safer place. A few weeks ago, I felt confident that the war would be a mistake, and now I am not so sure how to feel. One thing is for sure though, my prayers go out to our troops in Iraq and to the Iraqi people, and I hope and pray for a short war with few casualties. 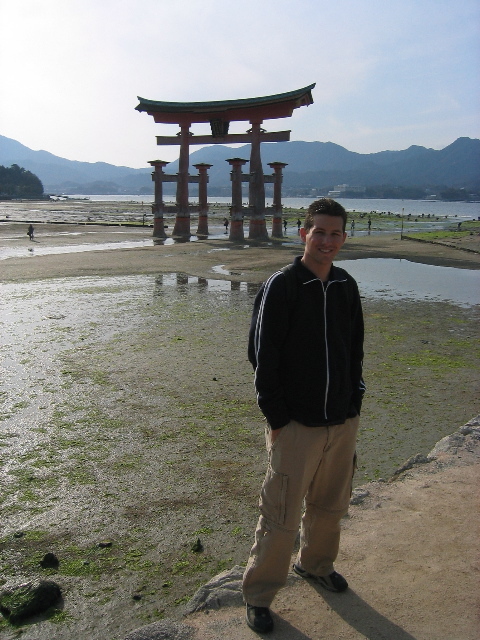 Tomorrow morning I leave for a three day trip to Tokyo before my last week in Japan in Kanazawa. I love you all and I miss you! We arrived in Hiroshima on Sunday night, and took a bus trip to our hotel — The Hiroshima Prince Hotel. The hotel is absolutely stunning, with an excellent view of the bay, large rooms, and good food. Its really a nice change from Kyoto! 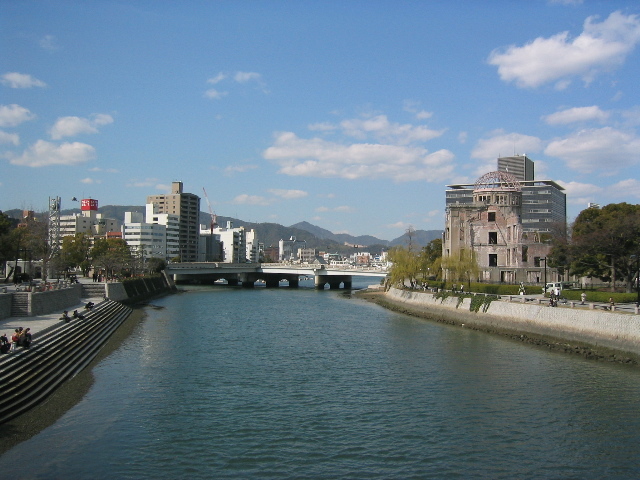 Hiroshima is also a much cleaner and more modern city than Kyoto, since it was essentially completely destroyed in fairly recent history. 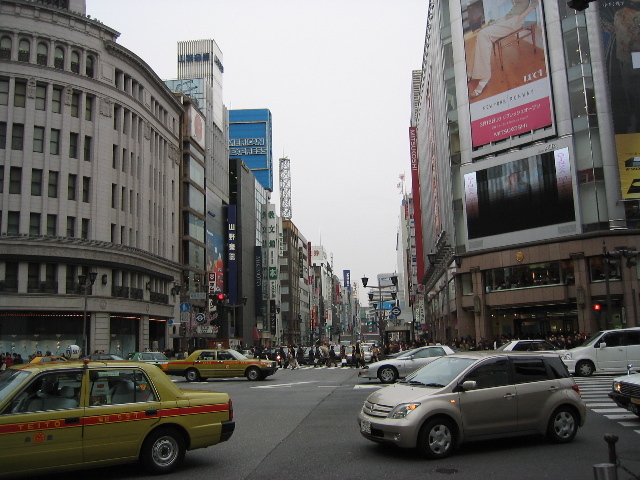 The streets are cleaner, the buildings more modern and attractive, and much more organized. The only real downside for our hotel is that it is very far from the center of the city. 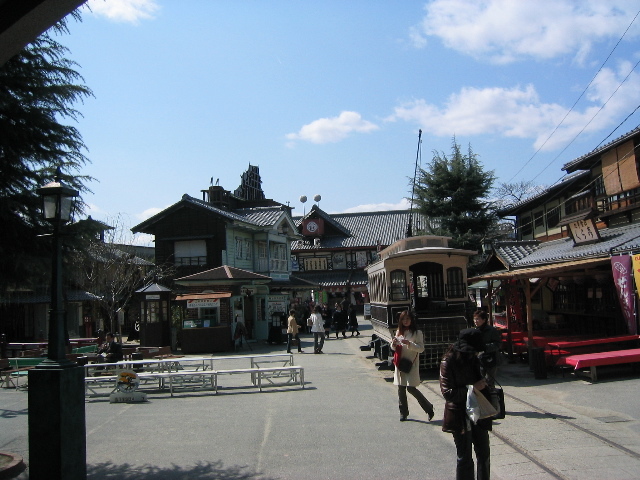 We can take busses into town, but they cost ¥230 each way (roughly $2.00 USD), so you have to really plan your days out. We cannot really walk anywhere but to the laundry. But, all in all, I really do enjoy the hotel quite a bit, and its a great change of pace. In addition, our hotel is right across the street from a massive indoor snowboarding arena, which sounds like a lot of fun! My first day in Hiroshima I spent doing laundry, and relaxing back at the hotel. But, today I actually went into the city! 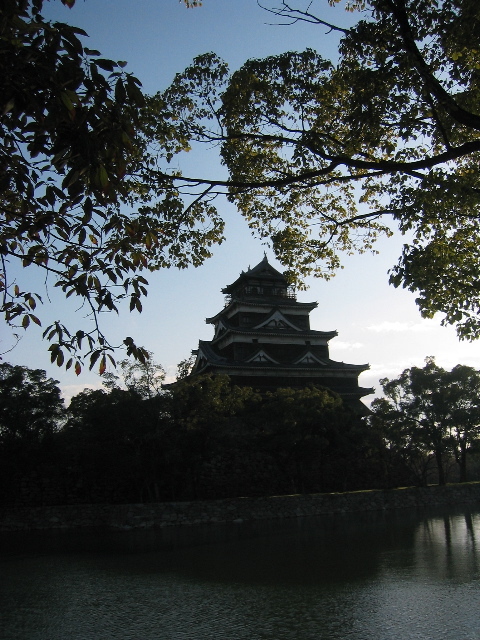 We first went to Hiroshima Castle, which is a fairly modern building, but is built in the traditional Japanese style. It wasn't nearly as cool as some of the other temples and government buildings that I have seen, but the view around it was quite nice. 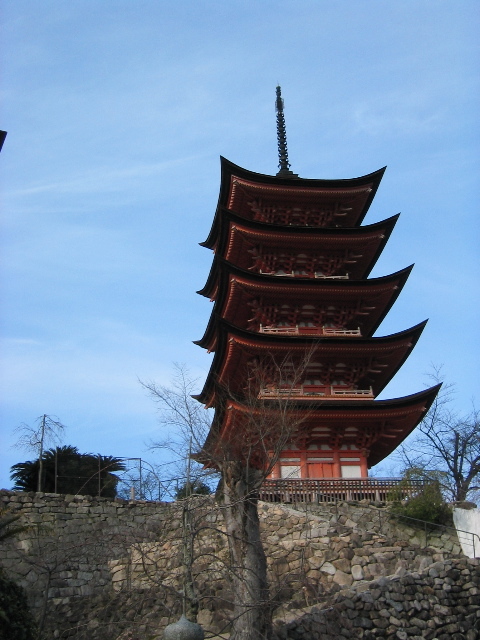 From the peak where the central pagoda sits, you can look out over the river and into the city, and see the stadiums and skyline of Hiroshima. Following our trip to the castle, we went to a really nice outdoor shopping center, and were able to see some fairly bizzare aspects of Japanese culture. 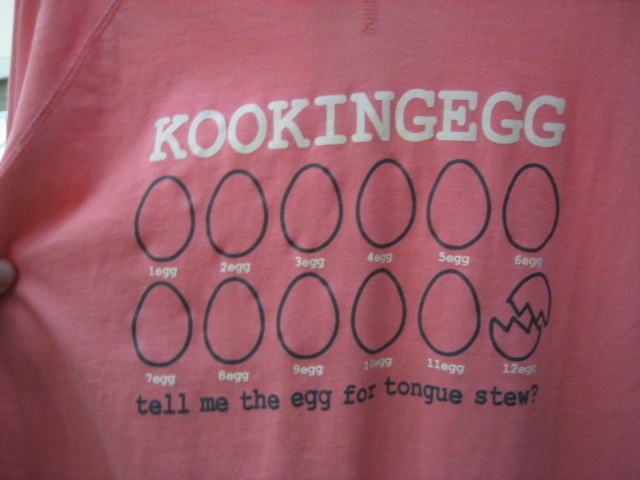 We went into a clothing store that had shirts featuring English words and phrases, but they made very little sense... 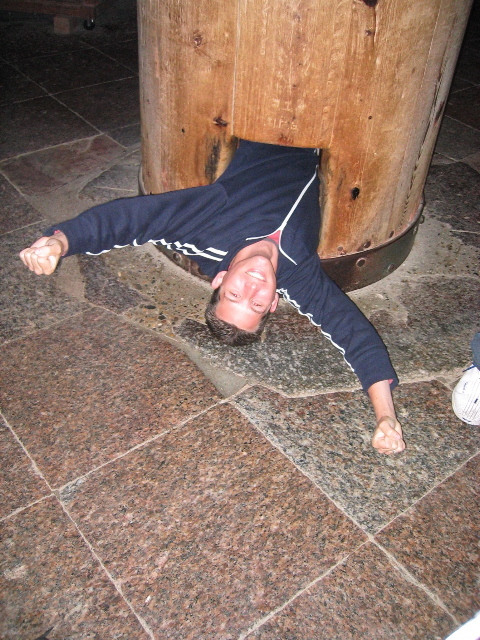 I have included some funny pictures with this entry that will give you the idea. I also went into the toy store, which had some of the strangest toys that I have ever seen, including video games about dating. 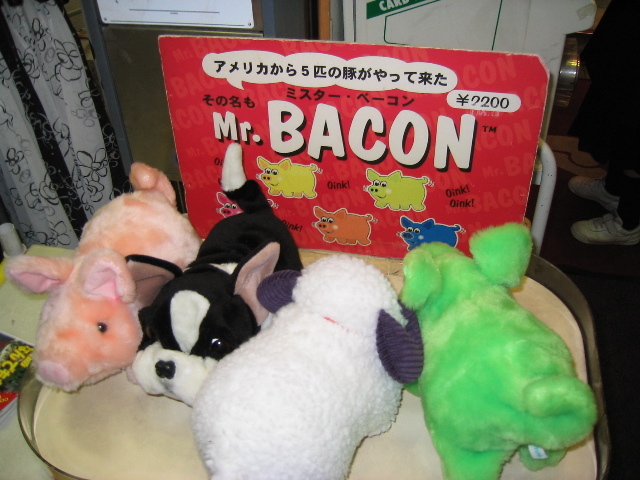 My personal favorite item in the toy store was a small furry pig doll named "Mr. Bacon"... I am not kidding, just look at the picture. 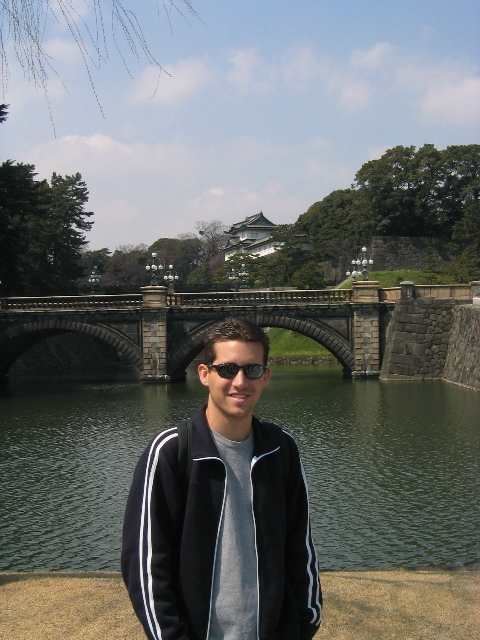 I am having a great time here in Hiroshima, and I am looking forward to the rest of my week. I am going to take a ferry to a small island called Miya Jima tomorrow, and then I am going to go and book some hotel rooms for my trip to Tokyo this weekend. Later in the week I will be visiting the Peace Park (site of the atomic bomb dome), and possibly going to a baseball game. I apologize for not uploading my blog entries more regularly, but most of the internet cafes I have found here in Japan do not allow me to plug in my laptop! I will see you all pretty soon! Yesterday, a large group of us piled into Kyoto Station with our rail passes, and hopped on an early morning train to Osaka. After a short walk, we arrived at the Osaka stadium around 10:00 AM, and purchased standing-room only tickets for a full day of Sumo Wrestling at a small cost of ¥ 1400 (about $12 USD). We went into the stadium in the morning to catch the early matches, and were surprised to find the arena to be fairly empty. It turns out that the wrestling goes on all day long, and that the lower ranking wrestlers wrestle in the morning, while the best and brightest wrestle after 3:00 PM. So, we watched some of the early matches, got a few pictures with the wrestlers, and then went to lunch. I had a fried chicken dish at a tiny restaurant, and wasn't really all that impressed. 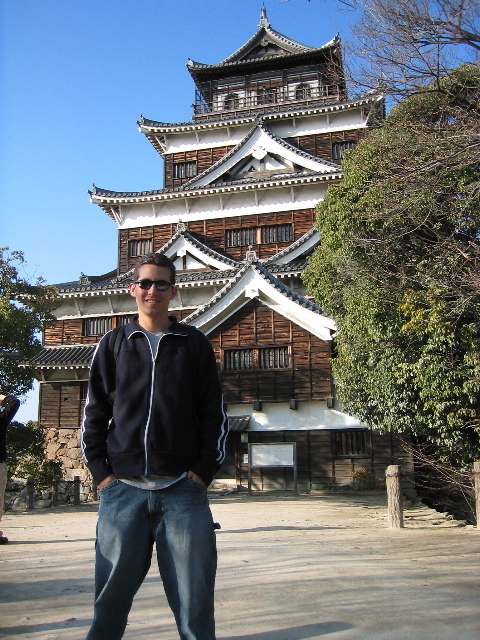 We then walked around Osaka for a little while before heading back in. 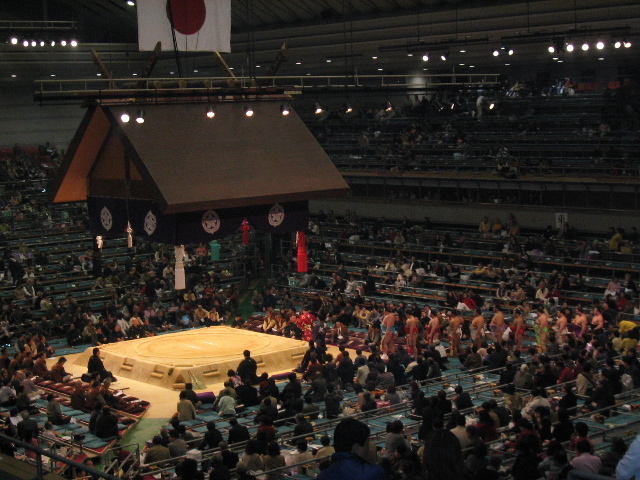 There was a pretty cool ceremony at 2:45 PM, where the high-ranking wrestlers come out and parade around the ring, and a lot of odd rituals and singing go on. Then, the big men started to battle — I have never seen fat guys this violent in my life! If you think that sumo looks violent on television, you should see it when these guys are pounding into each other live! It was a very cool experience and I had a lot of fun. 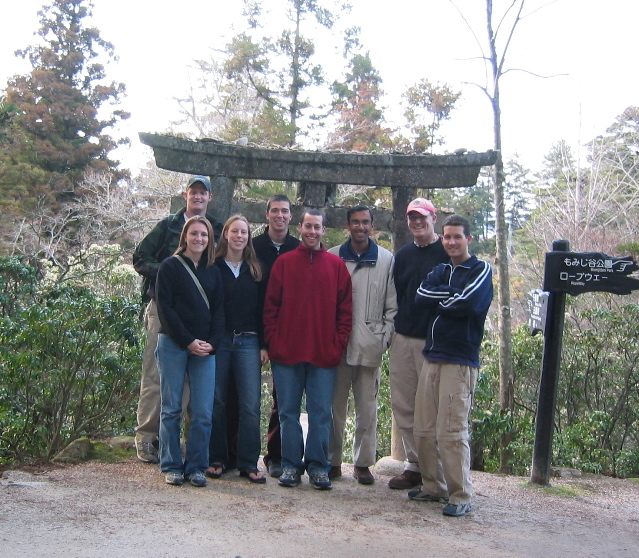 Today is our travel day, and our train was scheduled to leave at 4:47 PM from Kyoto Station, so a group of us decided to check out of the hotel a bit early, and go on a quick day-trip to Nara, which is a short 45 minute train ride away. We arrived in Nara around noon, and walked through the torrential rain to the Great Buddha Temple, which is one of the largest temples that I have ever seen. 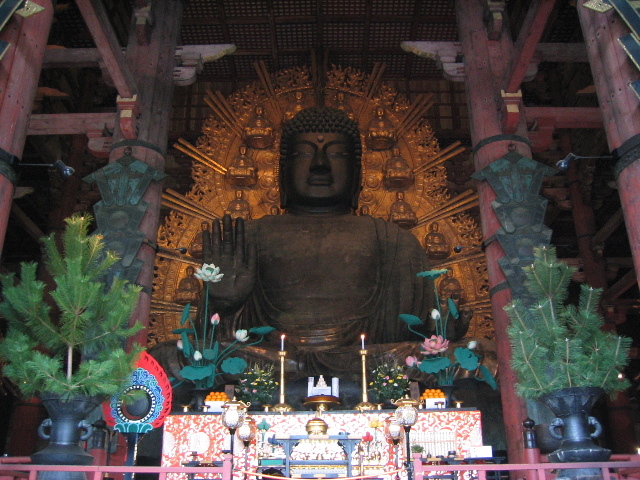 Inside the temple is a massive statue of Buddha, which must be at least 3 or 4 stories tall. 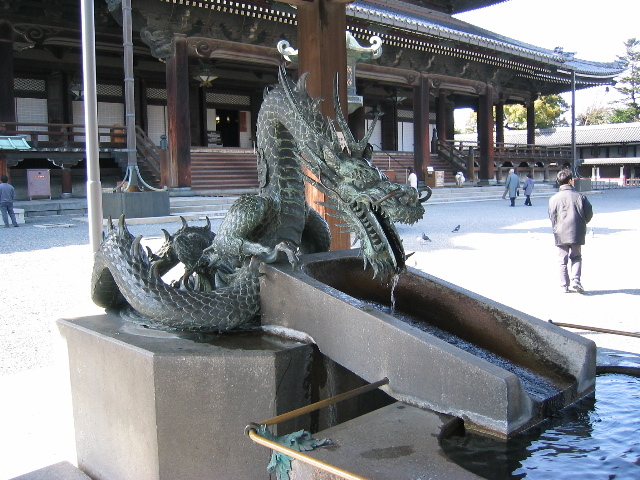 It is also home to a number of other cool statues and shrines. I am now riding on the Hikari Superexpress bullet train on the way to Hiroshima. This train is moving ridiculously fast, is very cushy, and also quite smooth — such a great way to travel! Japan is a very dense country through, and in my hour or so on the train thus far, I have seen very little green space, lots of ugly industrial areas, and a plentitude of advertisements. I really doubt that I could live in such a dreary place, and I am hoping that Hiroshima will change my opinion. Don't get me wrong, Japan is a great place to be, and I am having a blast, but I am very surprised at how uniformly dense and urban this country is so far. 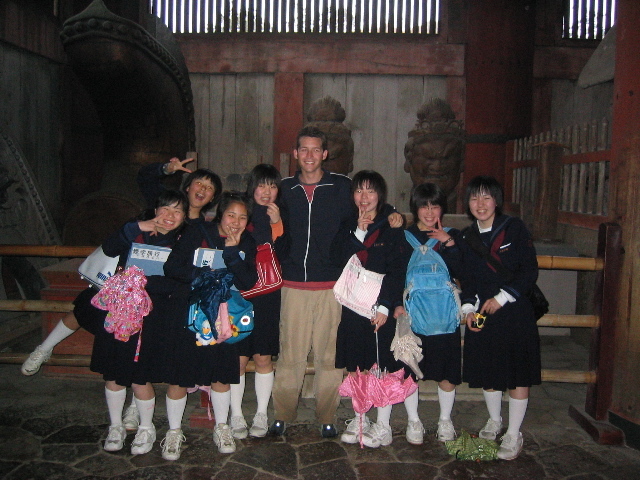 I am having an excellent time in Japan, and I am looking forward to my last few weeks away from home. Love you and miss you all! We arrived at our hotel late in the evening, after a long flight and a short bus ride. The hotel seems pretty nice from the look of the lobby, but the rooms are ridiculously small, and the bathrooms are even smaller. In fact, everything is smaller here in Japan, right down to the people. The bathroom looks like a slightly extended version of an airplane bathroom — and I am not kidding, this room is unbelievably tiny. The breakfast in the hotel is wonderful though, and is a combination of western and Japanese breakfast foods, including salmon, sticky rice, traditional miso soup, and tofu. The program purchased us meal coupons with a value of ¥1000 apiece, and we can use these to eat at one of four restaurants. 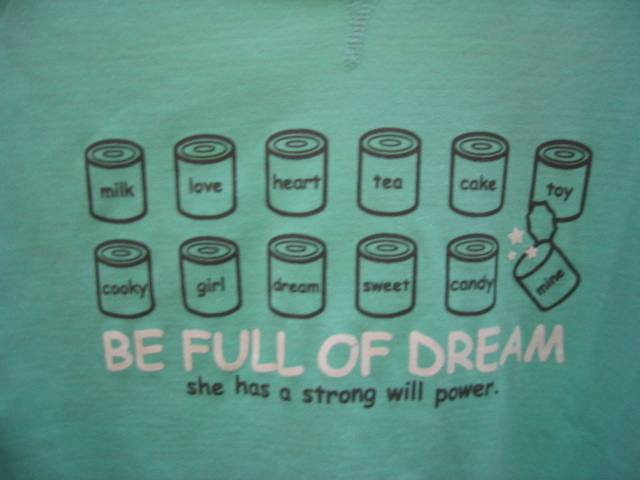 There is a traditional Japanese sushi place, a Chinese restaurant, a tempura and friend foods place, and a hearty foods (i.e. steaks, fried fish, etc.) place. The Chinese restaurant is by far the best, and they have a great noodle dish with egg, crab meat, and carrots with some spicy fried chicken, and fried rice. I tried out the sushi place, and ordered a dish with nothing but raw fish, and I wasn't really all that impressed with it — cooked fish is so wonderful, I can't really think of any reason to eat it cold and raw! One interesting thing that I did this week was visit the Kyoto Hanatouro celebration of lights at a temple in the heart of the city. 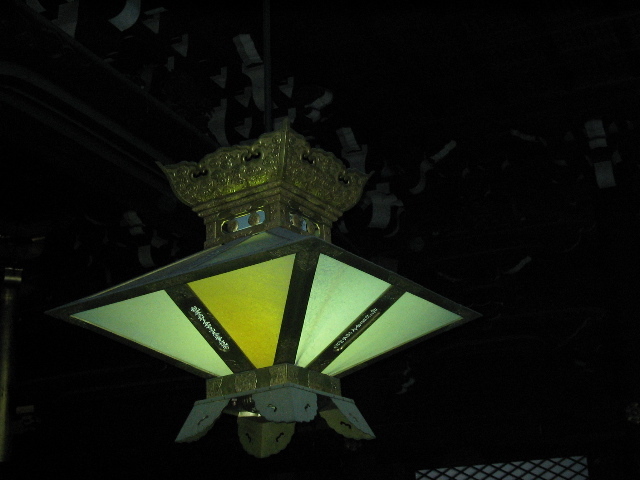 Once a year, to celebrate the lighting of the lanterns at the temple, a festival celebration is held for a week during the evenings. There was live traditional Japanese music, Geishas, art exhibits, and a huge stream filled with bamboo lamps. It was too dark to get any pictures, and its a real shame that I cannot show you this! It was absolutely beautiful! 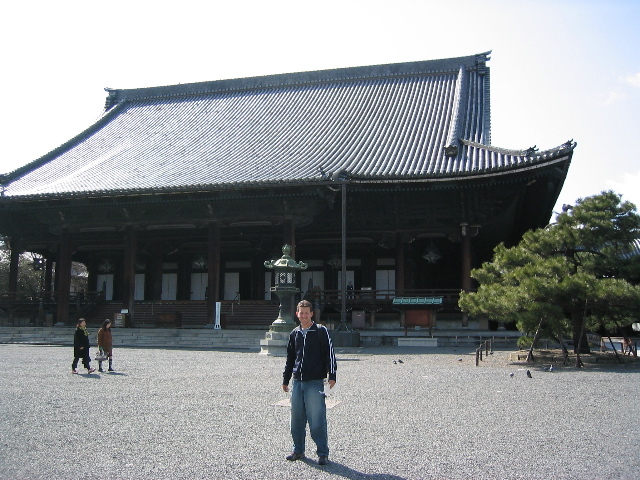 We also visited a second temple during the day called Higashi Honganji, which is right down the street from our hotel. 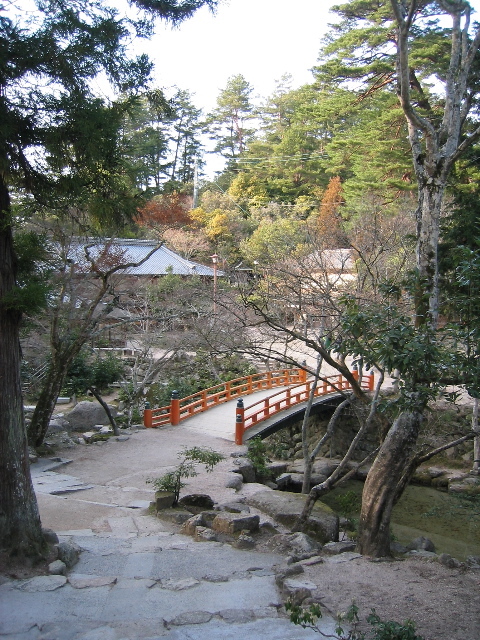 This temple is the Mausoleum of Shinran Shonin (1173-1262), the founder of Shin Buddhism, and also the mother temple of the Shinshu of Otani-ha, one of the largest Buddhist denominations in Japan. 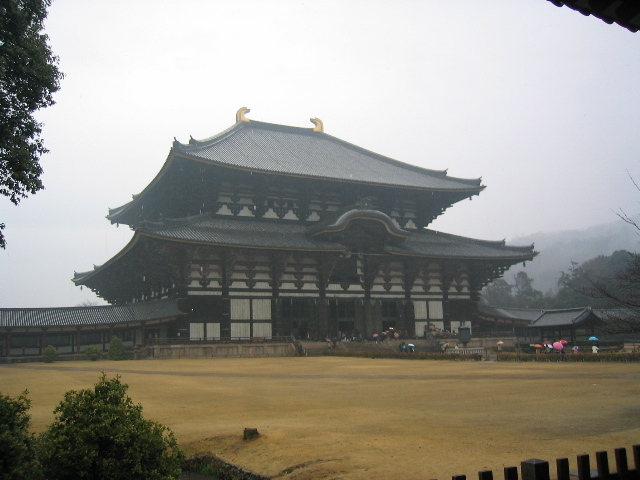 The temple is absolutely stunning, and is one of the largest wooden structures in Japan. We walked around for a few hours, and I actually did manage to take a few pictures here. Probably the most fun thing that I have done in Japan thus far is karaoke. A group of 9 of us found a tiny hole in the wall karaoke bar overlooking a river. We rented the entire place out for 2½ hours. We were able to eat all the snacks (crazy japanese snack food) and drink all the drinks (soda, beer, sake, etc.) that we could for the entire time. We had a complete blast singing, since we all knew each other and didn't mind making ourselves look too silly. It reminded me a lot of the good old Thad & Joe's back in the ATL! A few days ago, our class took a field trip to Kyoto Movieland, which is probably the single worst theme park in all of history! They make Samurai and Kung-Fu B-Movies at this park, and you can watch them film, take pictures with the Samurai and Geisha, and waste your money on silly plastic swords and chopsticks. One of the only redeeming parts about this day was the ninja show at the park, which was entirely in Japanese, carried out by terrible actors, and complete with all the insane music and plot twists that you find in Japanese Animation. I had a good time even though this was a silly park, just because it was so bad. 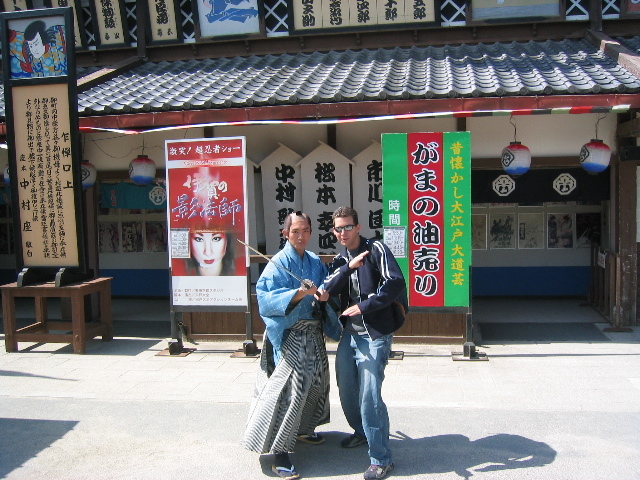 Another cool thing that we have done in Kyoto is visit all of the shops and markets that we can find. I haven't really been able to purchase very much, but its been really amazingly cool to look at all of the interesting things that you can buy here. Probably the coolest place is a massive electronics store on the 6th floor of Kyoto Tower building. They have all of the electronics that will be coming out in the U.S. in 2 years, including digital cameras the size of credit cards, tiny computers, cool MP3 players, and much much more. I walked around this place for a few solid hours playing with all of the cool gadgets! 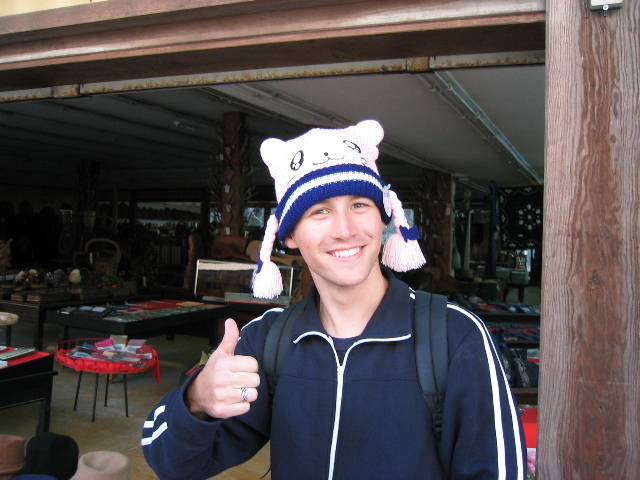 So far, I am having an excellent time here in Japan, and the culture shock hasn't actually been too bad! I have had a wonderful time trying to communicate with all of the people here. Its been fairly difficult to get even the most common things done, but with a phrase book, a pen, and a lot of bowing, its possible to get things done! 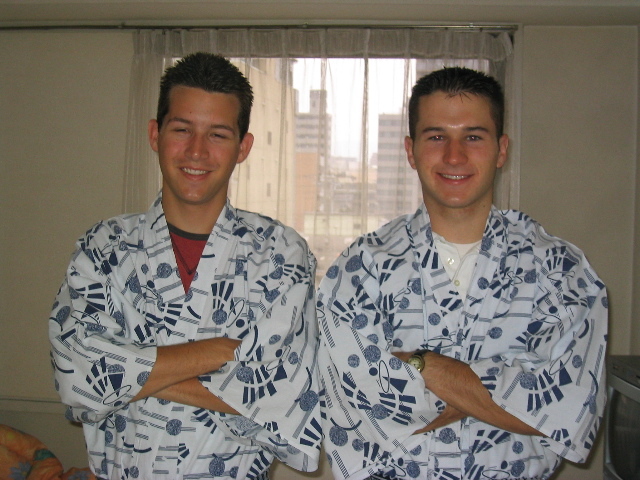 Tomorrow morning I am taking a bullet train to Osaka for a day to watch some Sumo Wrestling and walk around the town. Then on Sunday we are packing our bags and taking the train to Hiroshima! I will try and be better about my blogs, I still love you and miss you all! Saturday morning, we departed New Zealand for one last visit to Australia, and then to travel to Japan for our last three weeks of the trip. 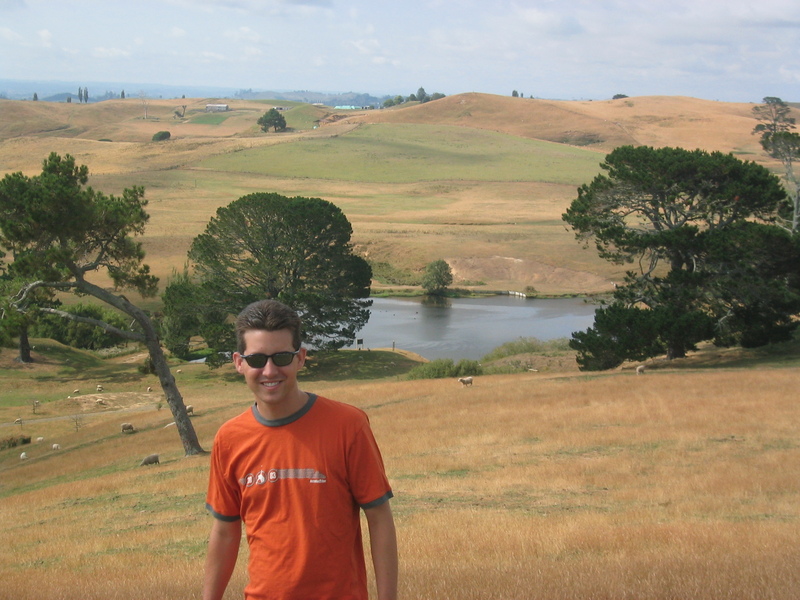 New Zealand was an absolutely amazing place, and I hope to be able to return one day. For a country of just over 4 million people, the Kiwis have accomplished so much on the world stage in sport, science, art, and culture. Their contribution to the world greatly outmatches their population size, and I was extremely impressed by the people. Kiwis are some of the nicest folks that I have ever met, and are intensely proud of their small country — and who could blame them? 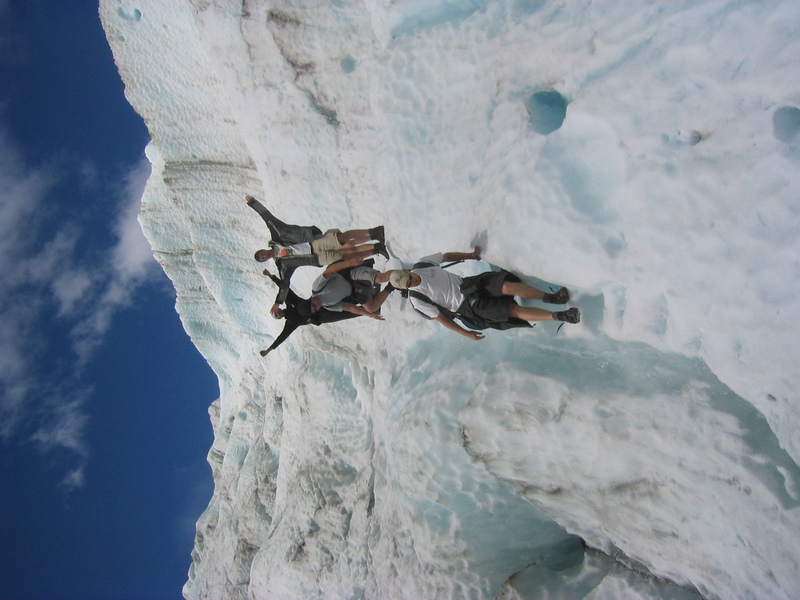 Where else can you climb glaciers, hang glide, climb mountains, see volcanoes, attend rugby championships, visit beautiful beaches, and see some of the most gorgeous landscapes that the world has to offer? I will truly miss New Zealand! 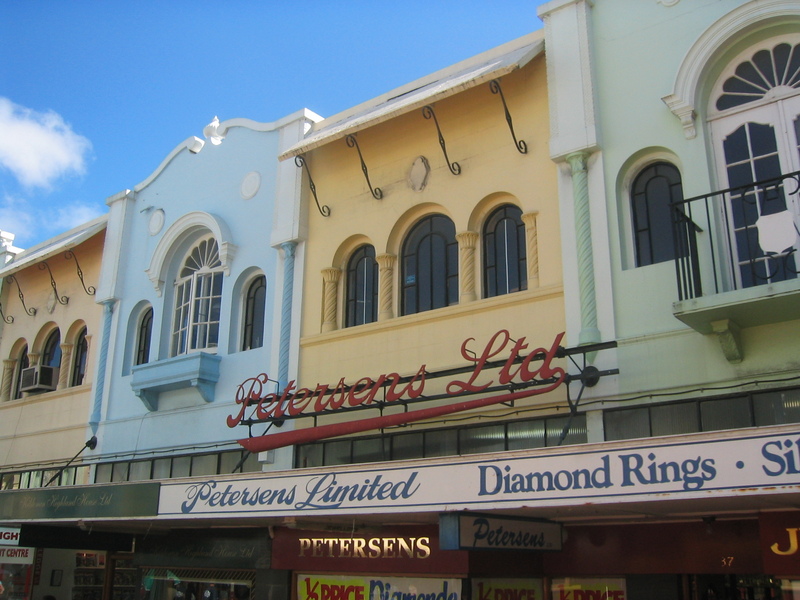 We left ChristChurch in the morning and arrived in Cairns late in the afternoon. I ate dinner on the plane, and collapsed in my hotel room early in the evening. We woke up in time to catch a cab to the Pier for our trip to see the Great Barrier Reef. Before we boarded the boat, I made sure to take several ginger tablets to prevent sea sickness (I learned that lesson the hard way on my trip to Moreton Bay). This worked very well, and after a beautiful 90 minute boat ride, we arrived at our diving location on the Great Barrier Reef. We were given wetsuits, flippers, and snorkels, and were able to freeley snorkel for several hours at a time at two different locations on the reef. I had been snorkeling on reefs before, but nothing compares to the beauty of the Great Barrier Reef. The scale is simply impossible to explain — its just huge. The fish on the reef are some of the most exotic and beautiful fish I have ever seen, and we also were able to see and touch several sea turtles. My experience on the reef was wonderful, and I truly enjoyed it! Unfortunately, I neglected to charge my batteries in my camera, and was unable to take any pictures, so I am going to have to make this entry pictureless! That evening, we went out to dinner at a very nice restaurant called the Raw Prawn. I ordered a dish with several different kinds of seafood, and some of the best fried shrimp that I have ever tasted (next to my grandfather's amazing fried shrimp, of course). The other people at my table all ordered a dish called the Hop, Skip, Hump, and Jump, which is an Australian favorite featuring portions of grilled kangaroo (hop), crocodile (skip), hump (camel), and jump (ostrich). I was able to try some of each, and all of them were absolutely fantastic. The waiter took a particular liking to us, and gave us free port wines and discounted desserts. I ordered a beautiful dessert called the Chocolate Extreme (Lacey, you would have adored this). We then went out on the town for a while, and took part in $5.00 AUD jugs of Victoria Bitter (translation: $2.75 USD pitchers of Bass). I turned in early after a very satisfying evening! I am now sitting on an 8 hour flight to Osaka, Japan, and am preparing for a bit of culture shock. Already, our food on the plane was very different from what I am used to, and I am hoping that I will be able to cope with all of the differences! Well, thats all for now, I love you and miss you all, and I will be sure to update this journal with some pictures of Japan as soon as I get the chance! This past weekend was my last in New Zealand, so a large group of us decided to go all out on a four day road trip. We packed 15 people into three small cars and headed out of ChristChurch late Thursday afternoon. We stopped a few hours down the road at Lake Tekapo for dinner, and one of our cars (mine) had a dead battery, because someone (me) was stupid and left the lights on. After a few tries and a call to the roadside assistance, we managed to jump our car and get moving. After several more hours of travel, our car then began to realize that we were running a bit low on gas (we had about a half a tank at this point, but you can never be too careful in a place like New Zealand). We drove and drove, but the further south that we traveled, the fewer signs of civilization we saw. Finally, we pulled into Cromwell, which is about 45 kilometers from our destination. We rolled into the gas station with about 1 litre of gas remaining in our tank as they were turning off the pumps, and they were kind enough to allow us to fuel up. Relieved, we arrived at our hotel in Queenstown around 1:30 AM, ready to sleep. In the morning, we awoke refreshed and ready for a big day. 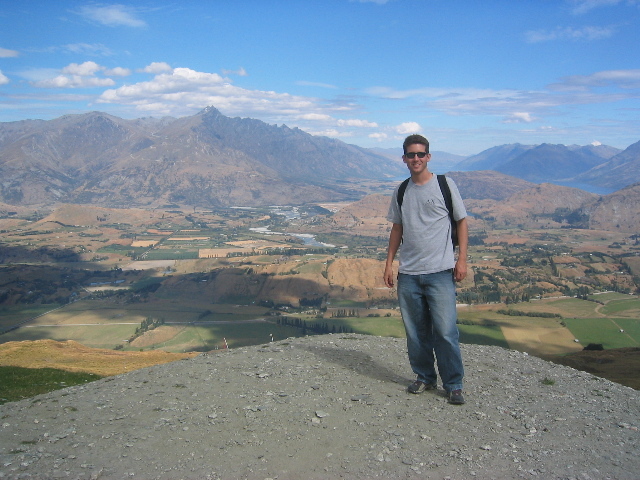 Queenstown is the adventure capital of New Zealand, with plenty of opportunities to skydive, bungee jump, jet boat, etc. In the morning, we elected to ride the "gondola" (a glorified ski lift) up to the top of one of the mountains to ride on the mountain luge. 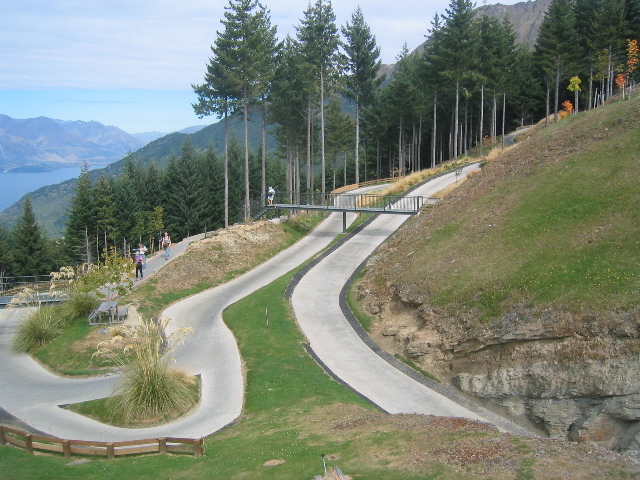 The mountain luge is essentially a concrete track that winds its way steeply down the mountain. 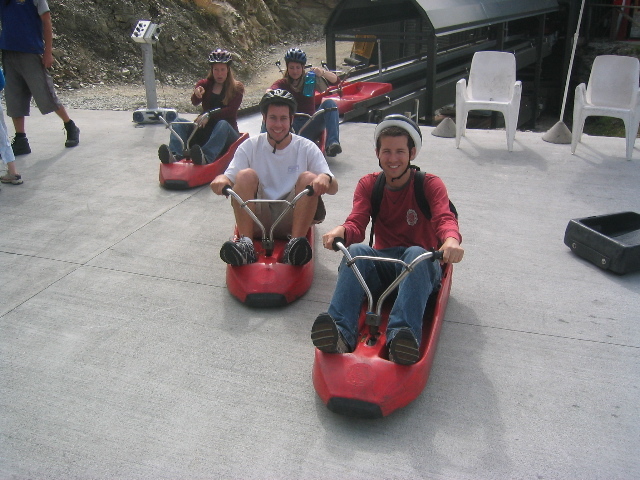 Once you purchase a ticket, and strap a helment on your head, you can ride a small sled-like cart down the track at extremely ludicrous speeds. This was an absolute blast, and we all had a great time racing each other, getting into wrecks, and generally causing trouble. After our fun on the luge, we headed back down the mountain on the gondola, ate lunch, and walked around the town, which is absolutely beautiful. Queenstown is nestled in the middle of a bunch of beautiful mountain ranges, including one of the most stunning mountain ranges in New Zealand, the remarkables. 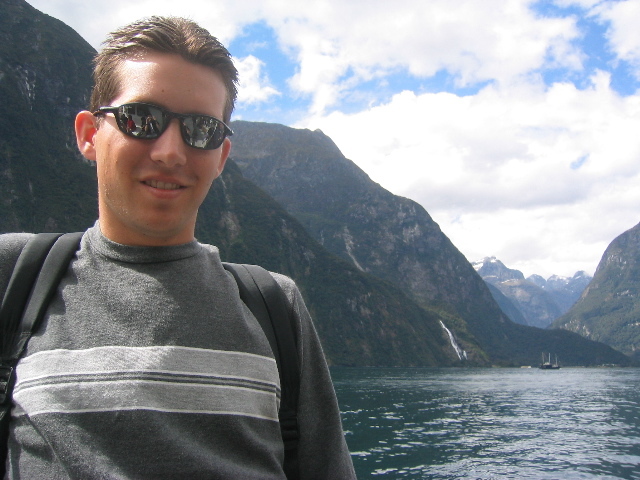 The mountains are broken up by small valleys and lakes, which Queenstown sits in the center of. Pictures and words really cannot do this place justice — it is easily the most beautiful place I have seen in New Zealand. 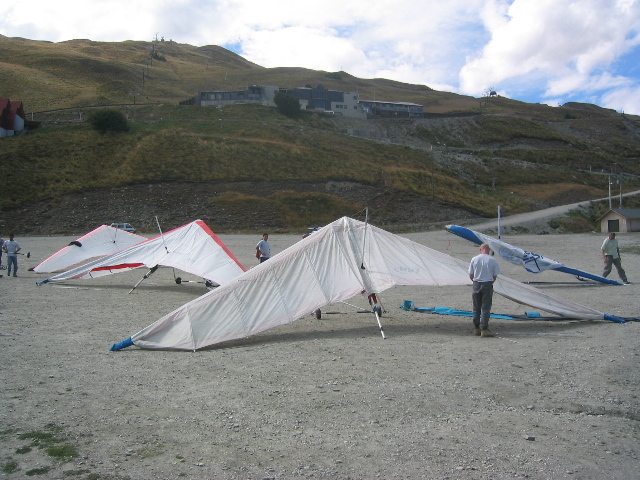 At 3:00 PM, three of us were picked up at the information center by the Thermal Velocity bus to travel a few kilometers out of town to go hang gliding. As we drove up to the landing site, the drivers talked with us about the experience and generally got us all excited about what we were preparing to do. Upon arrival at the landing site, we met with our pilots, and watched them disassemble the gliders to pack them up for our trip to the launching site. We then rode in a bus up the mountain to a small parking lot, and were given a brief lesson on how to take off, land, steer, and be safe. The view from the peak was absolutely stunning, and I was truly excited, but a little nervous, before takeoff. My pilot, a swedish guy named Anders, and I were coupled together by a few carabeaners, and we took our position underneath the glider. We picked it up, aimed it at the edge of the cliff, and waited for some wind. On Anders' command, we began to run together at full speed toward the edge, and continued running for a few seconds down the steep cliff until the wind picked us up. I pushed my feet against the bottom of my harness, as instructed, and we were airborne. The feeling of unhindered and controlled flight was amazing, and not at all frightening. The glider can be controlled effortlessly by leaning, pushing, and pulling. We glided parallel to the mountains for a while, enjoying the view, and looking for thermal pockets to ride to higher altitude. Suddenly, we found a pocket of rising, hot air, and shot upwards. Now high above the ground, we headed slowly away from the mountains. Anders allowed me to pilot the glider for a few minutes, which was sort of scary, but very cool. As we approached the landing site, I noticed that we were near the field in distance, but far too high above to land on it with our heading and speed. I asked Anders about this, and he smiled. He told me to push forward on the control bar as hard as I could, so I forced my arms forward, and our nose began to point directly upward. Anders took control, and we stalled, plummeting toward the earth, and then gracefully shot back upwards. We did a few more extremely exciting tricks, losing a lot of altitude, and then did a nose dive towards the ground, finally leveling off at the last second for a fairly smooth landing. What an amazing experience! We were only in the air for 15 or 20 minutes, but it was peaceful, beautiful, and exciting! Everyone should do this at least once. I have a roll of undeveloped film from a camera that was attached to the glider, and I will try and post some pictures as soon as possible. After hang gliding, we met up with the rest of the group to talk about all of our adventures for the day, and then drove until late in the evening to Milford Sound. We stayed in a hostel that evening, and it was very sub-par, but was the only place to stay in the extremely small town. There were no good working phones, no electricity after 11:00 PM, and a single cafe to eat at. In addition, gas is only pumped a few times a day, so you have to be very careful and timely about your arrival and departure times. In the morning, we drove to the harbor, and boarded a boat to take a 3 hour cruise. 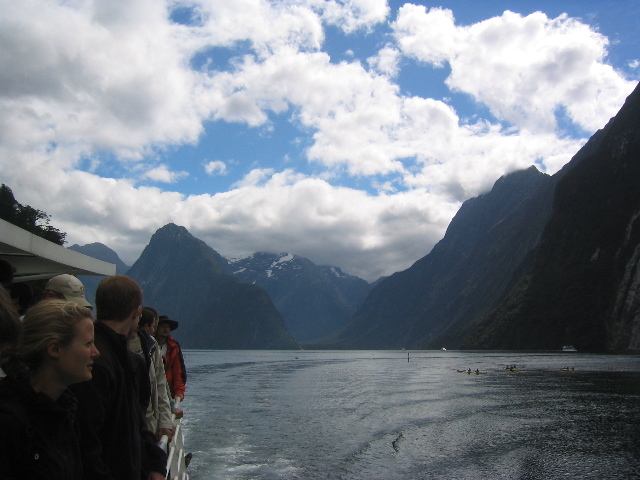 Milford Sound is actually not a sound, but a fiord that was carved out by glaciers in the last ice age. The result is a beautiful, very steeply walled mountain range enclosing a narrow channel of water. On our cruise, we saw dolphins, seals, an underwater observatory, and enjoyed the wonderful sights. Once we returned to the harbor, we set off for our next destination, Te Anui. Te Anui is a small town a few hours north of Milford Sound, and we checked into our hostel around 6:00 PM. We then headed into the city and ate dinner at a fantastic italian restaurant. I split an excellent pizza and a great pasta dish with a friend, and then we went out for a brief night on the town. Upon return to the hostel, we crashed into our beds, exhausted. This morning, we woke up around 9:00 AM, and drove 7 hours back to ChristChurch. It was an amazing weekend, and a great way to wrap up my time here in New Zealand! I still have a week left here in ChristChurch, and then I am off to Cairns, Australia and finally, to Japan! I love you and miss you all! Yesterday, a group of 10 of us decided that we wanted to learn a bit about Lawn Bowling, which is a very old sport mostly played by very old people. We had the hotel call the Riccarton Bowling Club, and let them know that we would be dropping by. After a short walk, we arrived at the club around 2:30 PM. Upon arrival, we were greeted by several nice old men who showed us around the club, and explained the basics of the game to us. They were also kind enough to lend us some bowls so that we could actually play a few games. The game is fairly simple in theory, but very difficult in practice. The field of play is a very finely kept grass surface, similar to that of a golf green. The balls (or "bowls" as they are called) are roughly the size of a large grapefruit and are similarly shaped. One side of each bowl is marked with a small insignia as the "biased" side of the bowl. When rolled, the bowl will drift in the direction of the bias, until it eventually falls over. The idea of the game is to try and get as many bowls as possible close to a small white ball that is rolled to the end of the field, called the "jack". You can either face the bias of the bowl inwards and roll it to the right of the jack, which is called a forehand bowl. Or you can face the bias outwards and toward your palm, and roll it to the left of the jack, which is called a backhand bowl. The bias of the bowl will slowly carry it back towards the jack, and with practice, you can cause the bowl to fall directly in front or behind the jack. Today, a group of us decided to ride the historic ChristChurch tram. 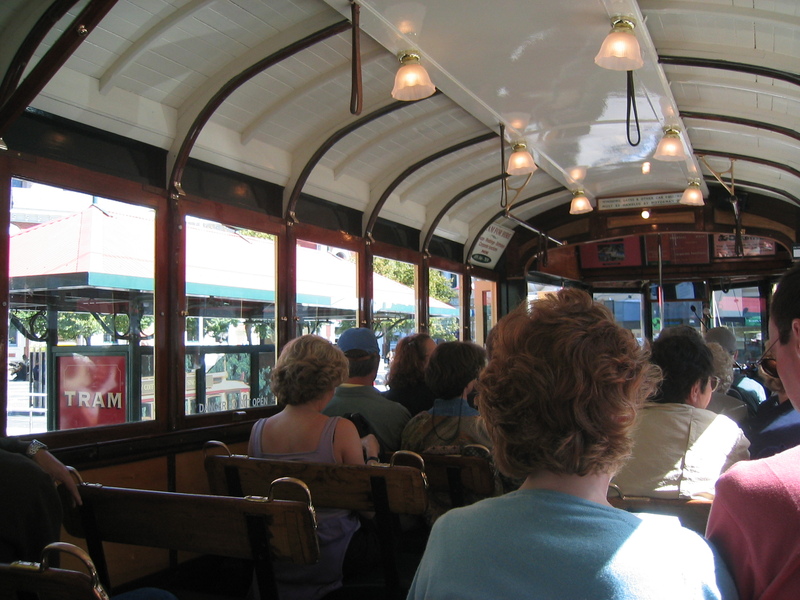 The tramway is composed of several beautifully restored trams from the latter part of the last century. 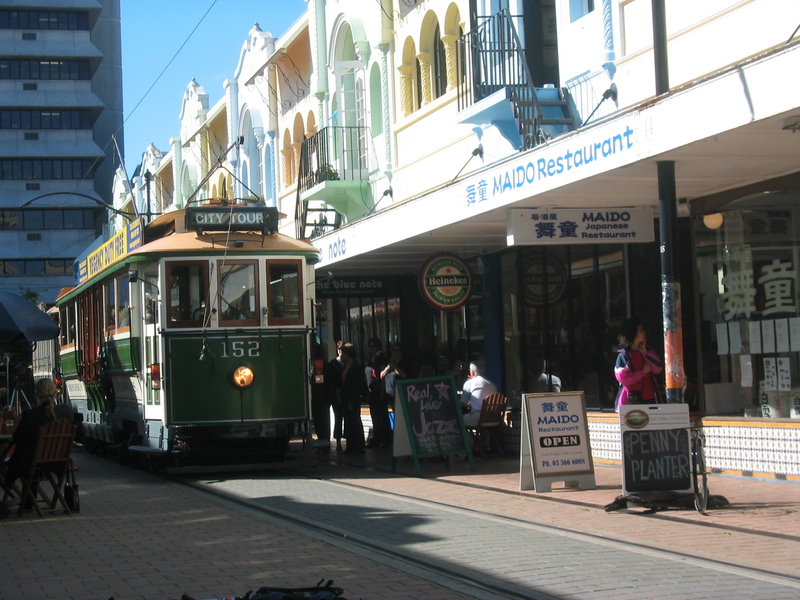 Trams, whether horse drawn, steam powered, or electric, have been a part of ChristChurch's culture since early in its history. In 1954, the trams disappeared from the streets of ChristChurch because of lack of interest and funding. 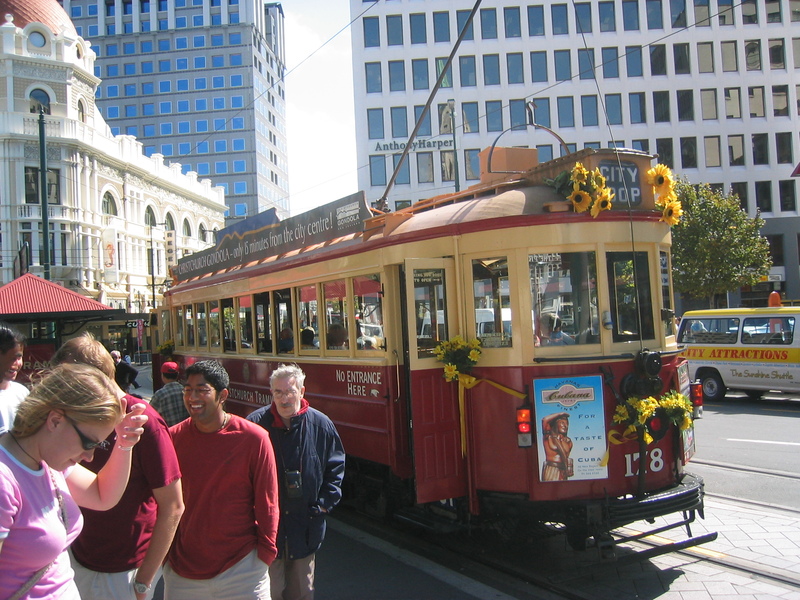 But, in 1995 the people of ChristChurch decided to make a return to the roots of their history by restoring and re-installing the familiar green-and-cream trams and returning the trams to service. Travelling by tram is a lot of fun, and is more than simply a method of transport. Trams are not really the fastest way to get around town, but they are highly refined and beautiful inside, and act as more of an event or experience than a simple way to get from place to place. The tramway even offers a specific car which doubles as a high-class restaurant. Those who desire an evening of fine food, drink, and socializing in the unique and luxurious interior of the tram can place reservations for any night of the week. While I am not enjoying ChristChurch nearly as much as many of the other places I have visited, I am starting to warm up to the place a bit =). Tomorrow a big group of us are driving down to Queenstown (the adventure capital of New Zealand) to go hang-gliding and to ride the land-luge. A bunch of people are also skydiving or bungee jumping, but I decided against both as they are expensive for a short amount of time. After Queenstown we are travelling to Milford Sound, which is supposed to be one of the most beautiful parts of all New Zealand. There, we will be taking a day-cruise complete with lunch and several scenic stops. We will return on Sunday afternoon with a long drive across the island through the Southerm Alps. 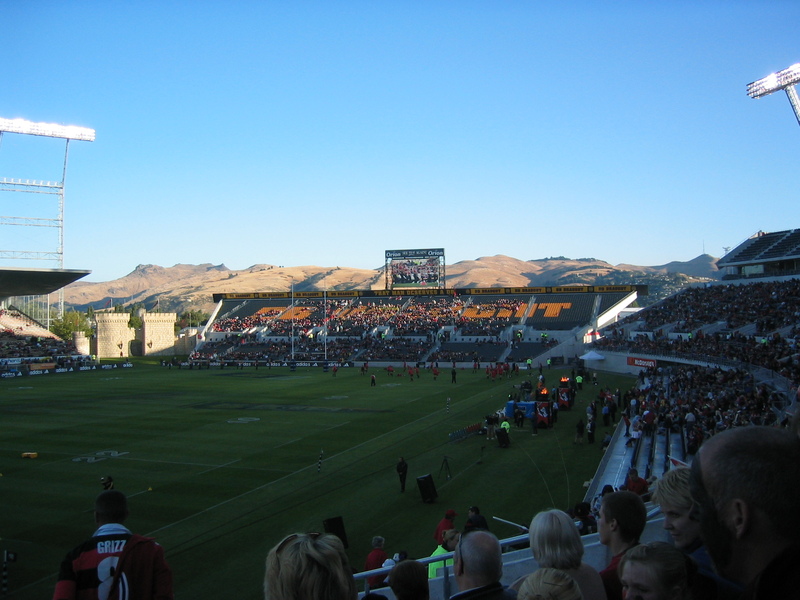 On Saturday evening, about 20 of us went to see the Wellington v. Canterbury rugby match at Jade Stadium. From my experience at the Sevens, I expected to see a bunch of drunken hoodlums in a sort of controlled riot =) This was exactly the opposite of what happened, strangely enough. It seems that rugby in ChristChurch is a family affair, and thus I spent most of my time at the game surrounded by annoying children. I had a great time anyway, but was a bit disappointed. I definitely enjoyed the sevens much more than the Super 12 match I saw on Saturday night. I have been sick for the last few days, and so yesterday I spent much of my time indoors. I managed to get out for a little while to go and visit the Arts Centre and to see a fair that was held in front of it. This was a lot of fun, and I was able to sample some excellent cheese, look at some fine art, and enjoy some great music. After the fair, I walked home through two parks and the Botanic Gardens. All of the parks and the gardens were beautiful, and I snapped a few nice photos to capture the experience. On Thursday evening, 9 of us jumped into a large van and started driving east from ChristChurch. We drove through the Southern Alps on narrow winding roads and across one lane bridges. Several of the bridges are not only one lane, but are also occupied by railroad tracks, so that you have to yield to oncoming traffic and potentially to oncoming trains! 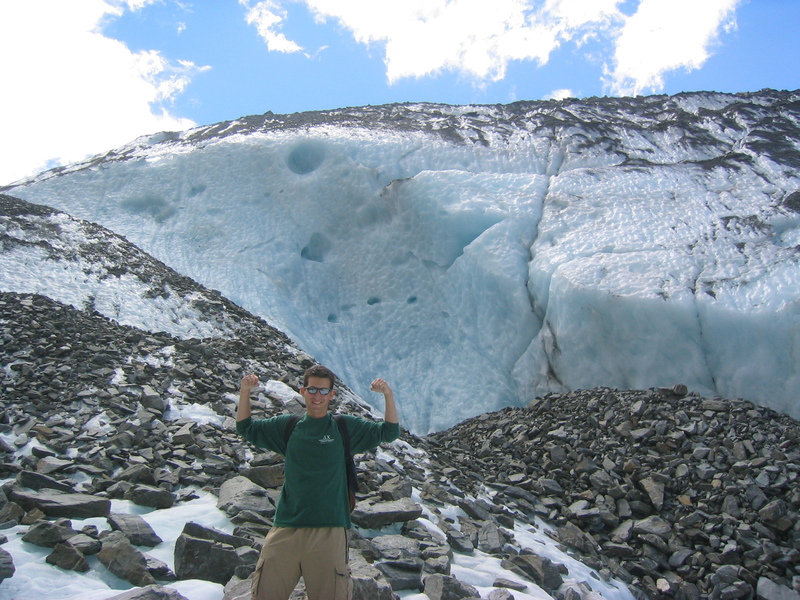 After several hours, we reached the center of the island at Arthur's Pass. 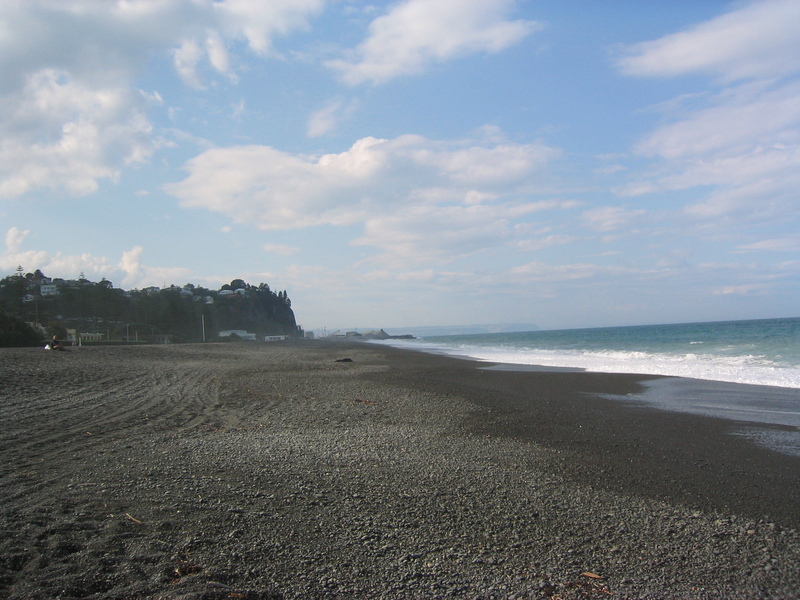 A few hours later we reached a small town just south of Greymouth on the western coast of the South Island. We stopped here for dinner, and then got back on the road, heading south. 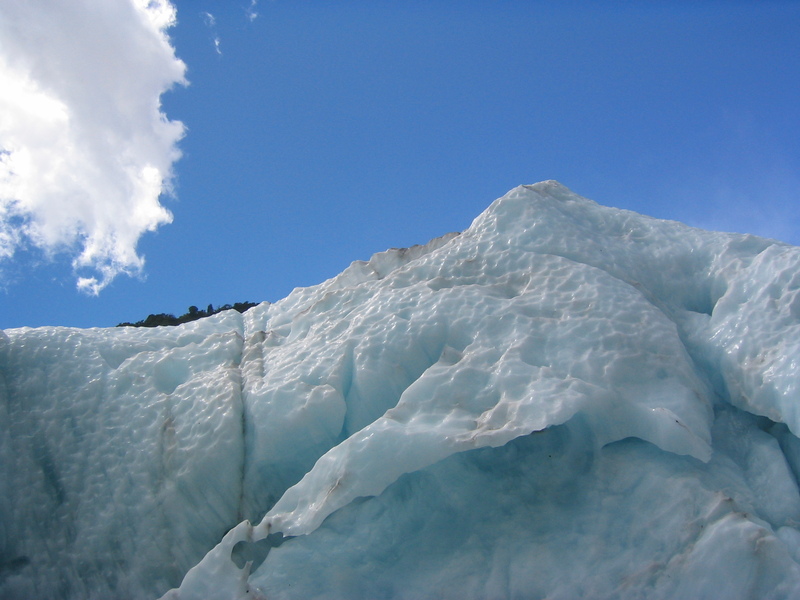 Around 11:30 PM, we arrived in Franz Josef, a small town next to the glacier of the same name. Our group separated and stayed in two different hostels for the night. 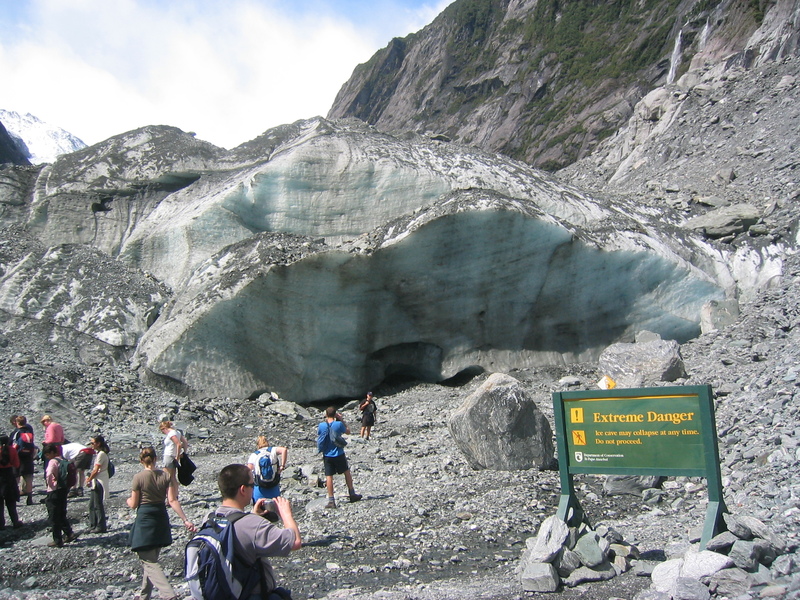 After a good night's sleep, we had breakfast and walked to the nearby adventure center to begin our hike on Franz Josef glacier. At the center, we were fitted with the World's Most Uncomfortable Boots ™ and some ice gripping attachments called Talonz. After the hike was over, we hopped back into the van for a long drive back to ChristChurch. This evening, a large group of us are going to attend a rugby match between the Wellington Hurricanes and the Canterbury Crusaders! I will make sure to update you all tomorrow on the game! I still miss you all, and hope things are going well back in the states! My last evening in Wellington was wonderful. We first went to a small brewery in the middle of the city and sat on the balcony — very fun. 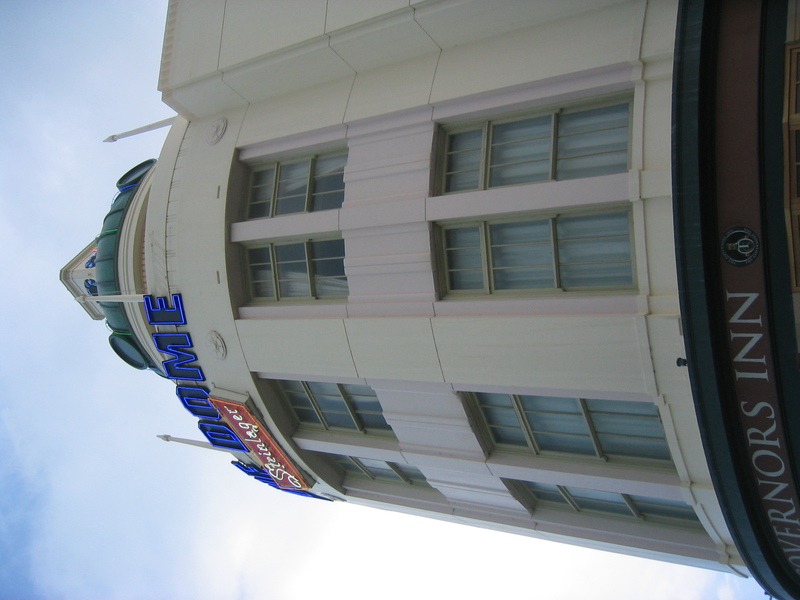 We then walked down to Courtenay Place, the center of night life in Wellington, and relaxed in a few pubs and bars. Then we walked up into the Botanic Gardens, just above the Weir House, and climbed a tree known to the locals as the "bucket tree." The tree is very dense, and is carefully trimmed to a large cylindrical shape with a flat top. 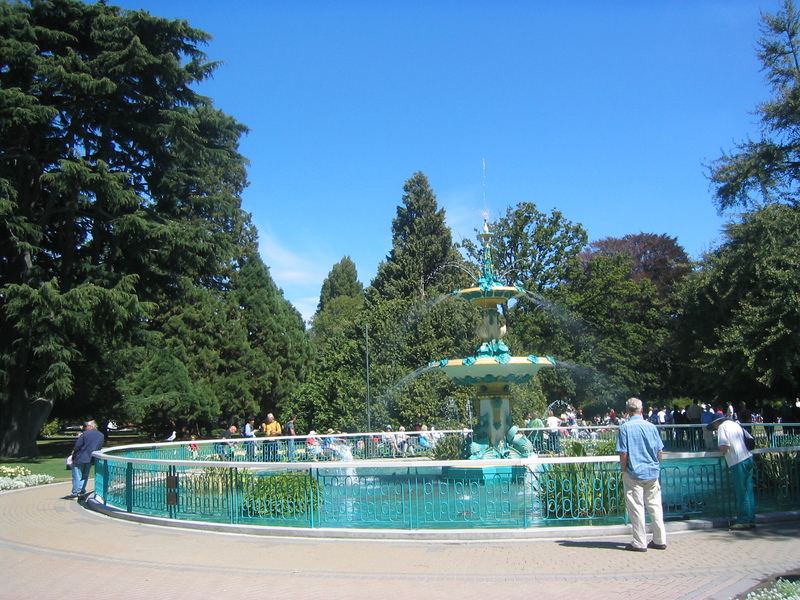 Because of its trimming and density, you can climb to the top of it, about twenty-five feet off the ground and on the crest of the highest hill in the gardens, and you can lay down on the flat canopy of the branches. We stayed in the tree until around 4:00 AM and then walked back down to the dorm to catch a few hours of sleep before our bus departed at 8:30 AM. I woke up at about 7:30 AM absolutely exhausted, hurriedly packed my stuff, and boarded the bus for the airport. We then boarded a tiny dual-prop plane for our short hop flight from Wellington to ChristChurch. We are staying in a very nice hotel near the center of the city. It only has one computer in the business center, which is hooked up into a modem for internet access — I will have very limited access to email and the web. The plus side is that the food is great and will be a wonderful change from my selections at the Weir House in Wellington. So far, I like it here in ChristChurch. 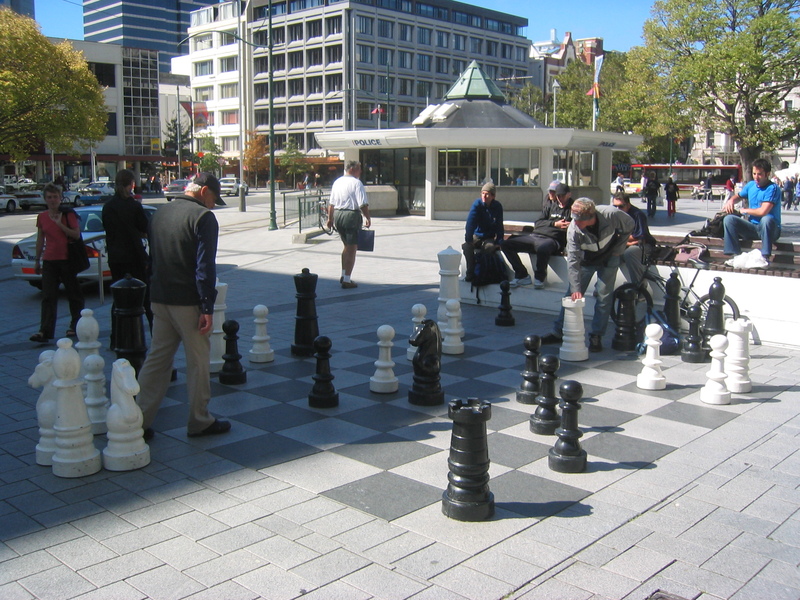 The city is much different than Wellington in that it is flat, spread out, and full of gardens and parks. It makes sense that I am studying Victorian literature and culture here, since the entire city feels like an old English city. On the other hand, I really miss Wellington already. I grew very attached to the place in such a short time, and I will really miss the wonderful people I had the opportunity to see there, and the amazing and beautiful landscape of the city. I have already planned out my two weekends here, and I am really looking forward to them. 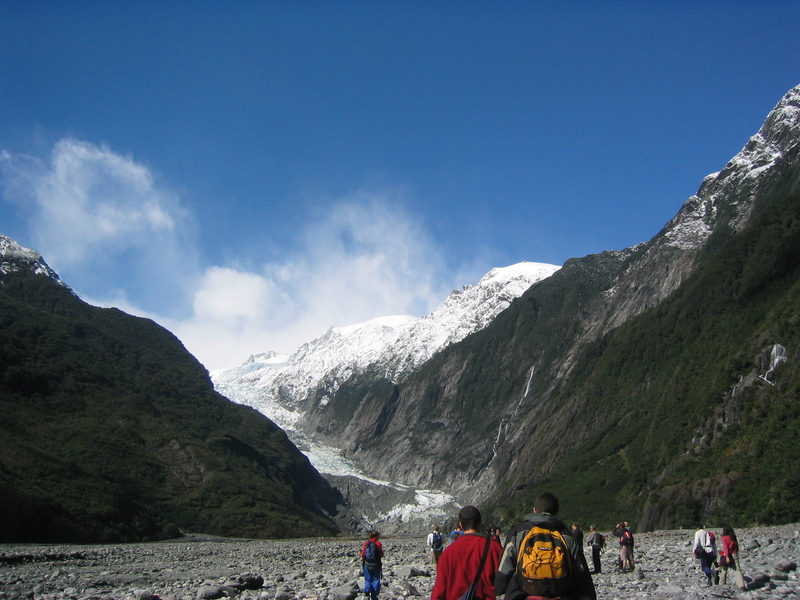 This weekend, 12 of us are renting a giant van and driving across the island through the Southern Alps to climb and hike on the Franz Josef glacier and possibly go to sail in the fiord-lands. 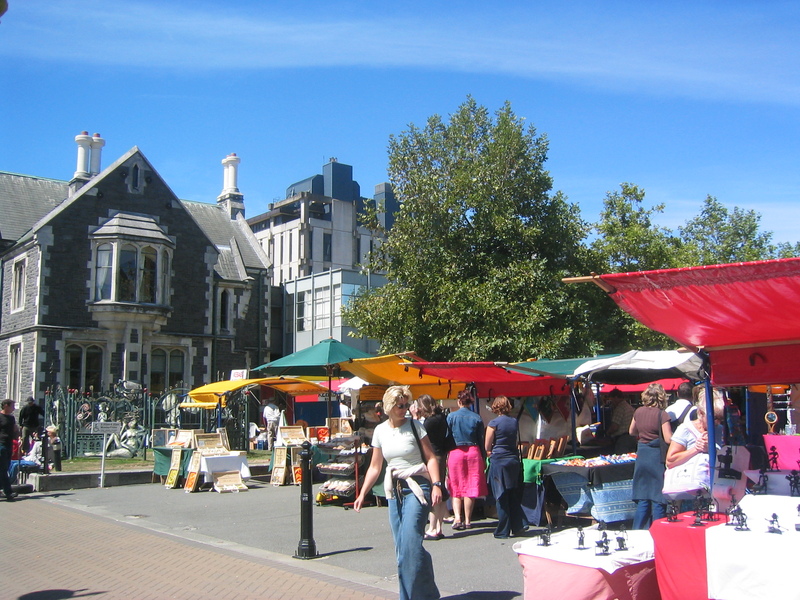 We will then drive back and go to the Canterbury vs. Wellington rugby match in ChristChurch. Next weekend, a few of us are going to rent a car and drive to Queenstown, the adventure capital of the world. Most people will be skydiving or bungy jumping, but I am not really interested in those things... a bit too dangerous =) We are going to go jet-boating down the fiords, ride a helicopter into a canyon, and possibly go white water rafting. Then we will be headed back to Australia for 2 days to snorkel in the Great Barrier Reef. I have a lot to look forward to! I will update you all soon on how much I am enjoying ChristChurch! I love you and miss you all! This weekend was my last in Wellington, and I am currently packing and preparing for my trip to ChristChurch on the South Island tomorrow morning at 8:30 AM. I wanted to make sure that this weekend was a good one, so we planned a huge road trip in a 10-passenger van, leaving on Thursday evening. Our first stop was a campground in Matamata, a small farming community in the northern part of the island. Why did we stop here, you ask? Well, in 1999, a helicopter was flying over New Zealand and looked down to see a farm in Matamata. 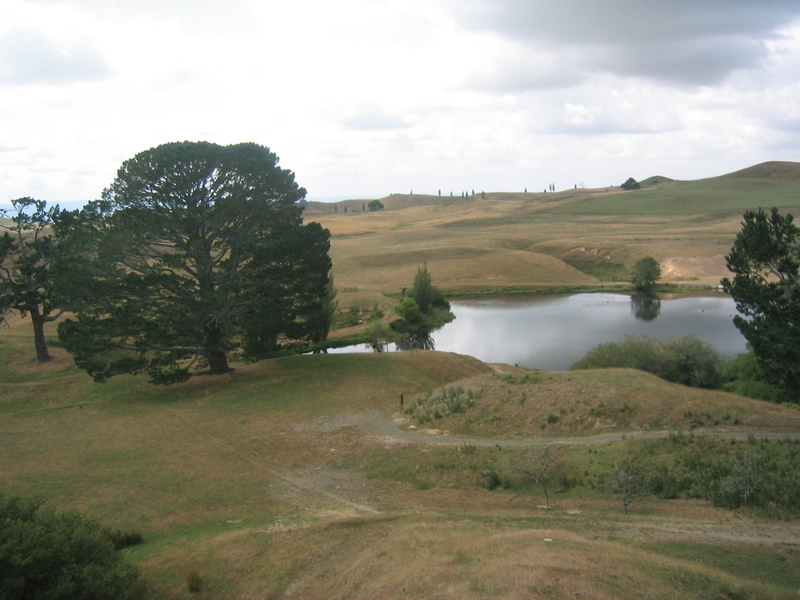 This farm had a few unique features, such as a lake, a very attractive and symmetrical tree, and a rolling landscape surrounding it. A few days later, an executive from New Line Pictures showed up at the farmer's door and asked the farmer if he could use his land in a movie trilogy called The Lord of the Rings. The rest is history — Matamata is now known around New Zealand as Hobbiton. 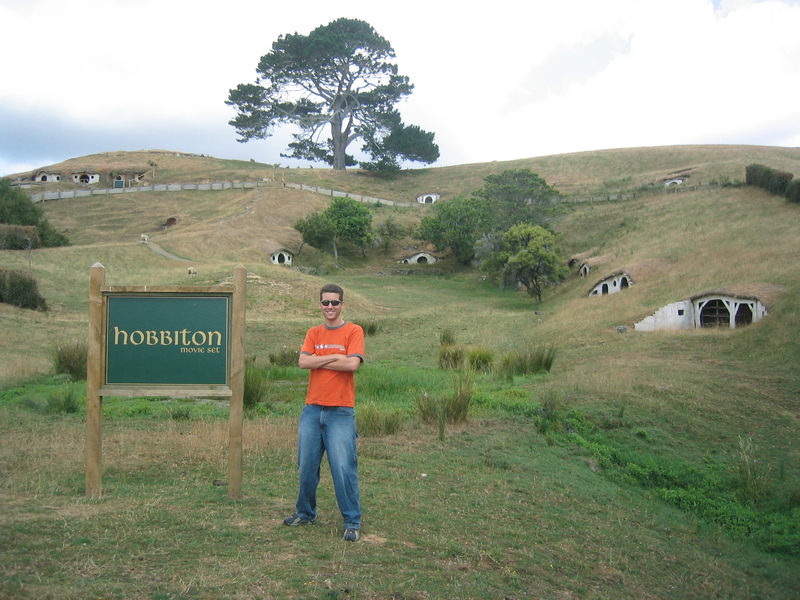 In the morning, our group took a tour of the Hobbiton movie set, which allowed us to see the remains of the hobbit holes from the films, walk around the lake, visit the "party field" and the famous "party tree", and take a lot of pictures. We were able to get a few group shots of us at Bag End (Bilbo's home), and one of me under the party tree where Bilbo gave his speech. 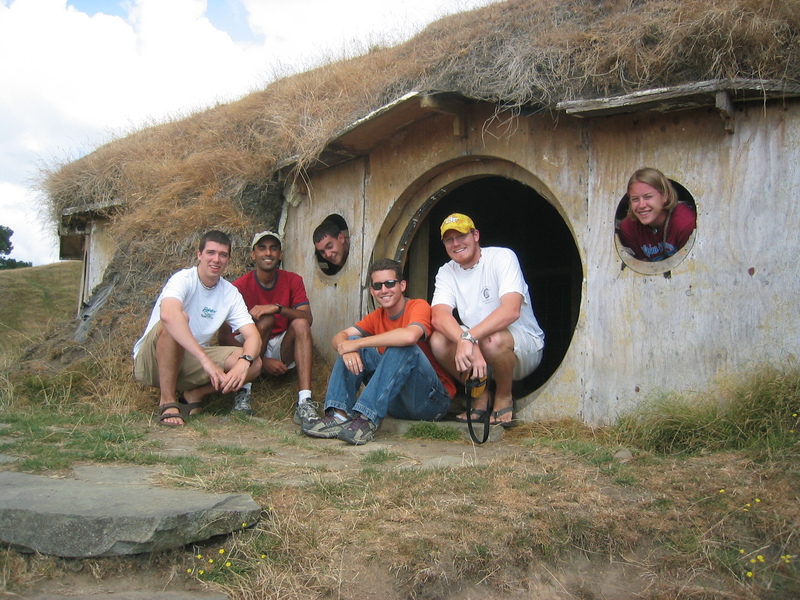 Most of the set has been destroyed, as it was made of polystyrene and plywood, but many of the hobbit holes remain, including the most important few. The family that runs the tour is not even allowed to maintain the remaining holes, so I was lucky to be able to see it while its still possible! Following our tour in Hobbiton, we hopped back into our van and began the long drive southeast to the coastal wine country. The city in the center of the wine country is called Napier, and is on the east coast of New Zealand. 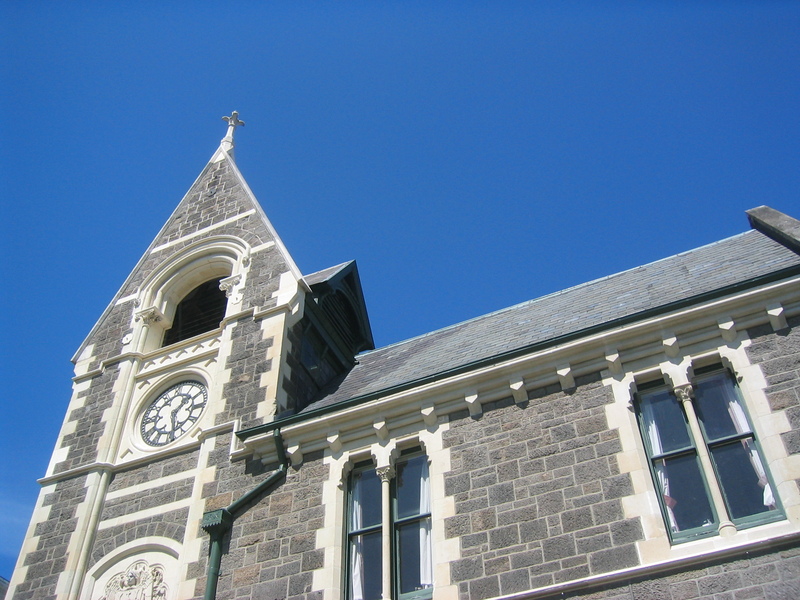 Many years ago, Napier was hit by a massive earthquake and was completely destroyed. Following the quake, the city's people decided to rebuild the city in the grand Art-Deco style. This weekend was the city's annual Art Deco Weekend, and we were there to witness it. The city is quite beautiful, and I unfortunately was unable to take many pictures while I was there, but there are many pictures available of the city itself on the internet. 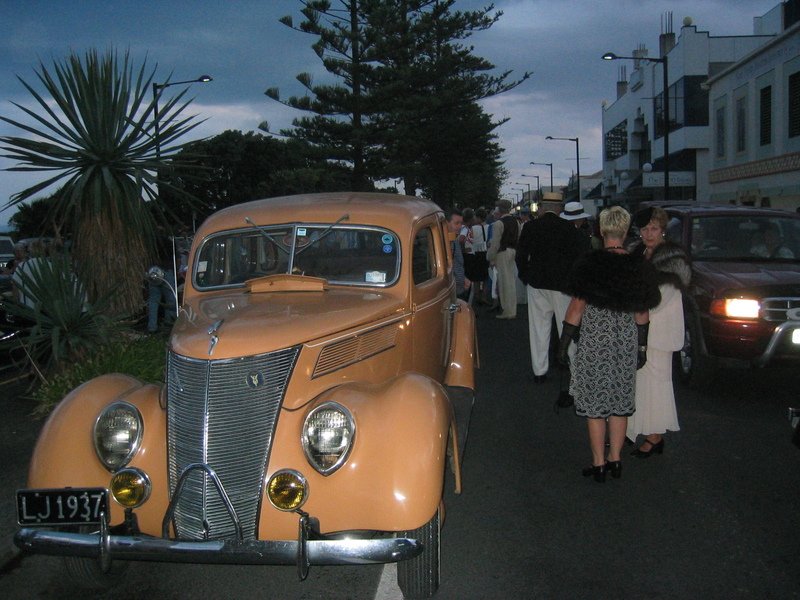 It was packed with old-time cars, and people dressed in the extravagant style of the early 20th century. 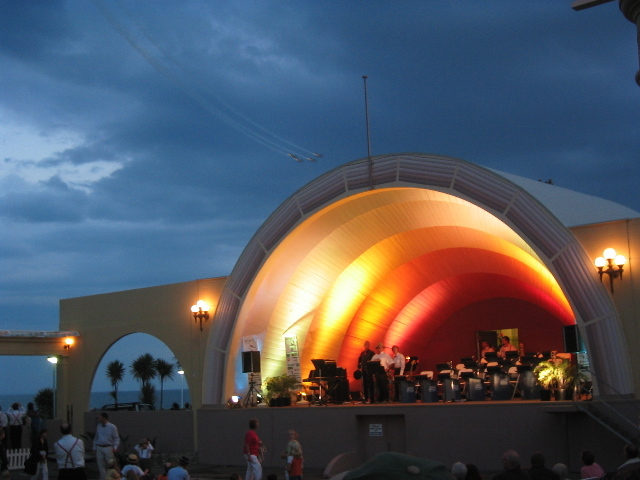 They all pack into the city, dance to jazz music on the beach, and enjoy the Art Deco scenery. We ate a beautiful dinner in Napier, enjoyed the sights, and were back in the van by 9:00 PM to travel to our final campsite at Kaitoke Regional Park, which I had visited a few weeks ago. About 10 minutes after we left Napier, rain started to pound the car, and I had to drive the old, creaky, manual transmission van through the windy and narrow mountain roads in the rainy dark... this was not so much fun, but now I am a pro driving on the left hand side of the road and shifting with my left hand =). When we arrived at the park, they had locked the gate, so we parked in the car park. The van can hold 10 people sitting up, but only 4 can really sleep in it, so me and two other brave souls grabbed a tent, and hiked in the rain until we found a suitable campsite. Surprisingly enough, we slept through the night without the tent springing a leak, and woke up dry and refreshed! Talk to you soon from ChristChurch!